· Hunters Video DVD: "Hunting in Kazakhstan and Mongolia"
March 31 -- This announcement (the "Announcement") is made by Mongolian Mining Corporation (In Provisional Liquidation) (the "Company") pursuant to Rule 13.09(1) of the Rules Governing the Listing of Securities on The Stock Exchange of Hong Kong Limited (the "Listing Rules") and the Inside Information Provisions under Part XIVA of the Securities and Futures Ordinance (Cap. 571 of the Laws of Hong Kong). References are made to the announcements of the Company dated 8 July 2016, 11 July 2016, 13 July 2016, 21 July 2016, 26 August 2016, 31 August 2016, 2 September 2016, 11 October 2016, 28 October 2016, 3 November 2016, 20 November 2016, 21 December 2016, 22 December 2016, 19 January 2017, 23 January 2017, 20 February 2017, 8 March 2017, 14 March 2017 and 21 March 2017 in relation to the proposed debt restructuring of the Company (the "Debt Restructuring"). The Company announces that in relation to the Debt Restructuring, a notice has been published by the Company concerning, among other things: (i) the filing of a petition with the Bankruptcy Court for the Southern District of New York under chapter 15 of title 11 of the United States Code, 11 U.S.C. §§ 101-1532 for recognition of the provisional liquidation proceeding of the Company pending in the Cayman Islands, (ii) the related motion for enforcement within the United States in respect of the Cayman Islands scheme of arrangement proposed to be sanctioned in the Cayman Islands between the Company and the holders of its senior secured notes, and (iii) the hearing on the petition and motion. A copy of such notice is appended to this announcement. Ulaanbaatar, Mongolia, 29 March 2017 (Oyu Tolgoi LLC) Oyu Tolgoi today announced an update on its performance for the fourth quarter and full year 2016. In Q4'16, concentrator throughput increased 7.4 per cent over Q3'16 resulting in an average daily rate of 106,700 tonnes for the quarter, which was a quarterly high to date. Oyu Tolgoi Managing Director Armando Torres said, "Our industry leading safety performance over 2016 demonstrates once again that safety always comes first at Oyu Tolgoi – and this is a result we are extremely proud of. This is a foundation for everything we do – from delivering a strong operating performance, to progressing underground development – and made possible by our talented workforce, which is over 90 per cent Mongolian." 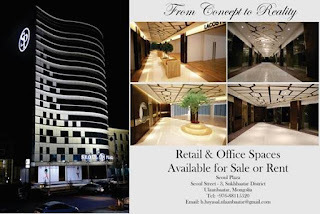 "The strength of our performance is seen in our contribution to our community – with US$210.6 million in taxes, fees and other payments to the Government of Mongolia, US$279 million in national and South Gobi supplier spends, and continued investment into sustainable development initiatives – as we together build a world class business that contributes to the prosperity of Mongolia"
Oyu Tolgoi operated at record levels in 2016. Productivity improvements in the concentrator implemented throughout the year led to throughput exceeding nameplate capacity by year end. Copper production of 201,300 tonnes for 2016 exceeded the Company's guidance of 175,000 to 195,000 tonnes and annual gold production of 300,000 ounces exceeded 2016 guidance of 255,000 to 285,000 ounces. Compared to 2015 results, mined production for 2016 increased 5.6 per cent, concentrator throughput increased 10.5 per cent, copper production was similar and, as expected, gold production decreased 54.1 per cent. Decreased gold production for 2016 reflects the impact of declining grade from the completion of Phase 2 mining in the second half of the year. Oyu Tolgoi performed well during Q4'16 as open-pit operations focused mainly on Phases 4 and 6. Q4'16 concentrator throughput increased 7.4 per cent over Q3'16 resulting in an average daily rate of 106,700 tonnes for the quarter, which was a quarterly high. Copper production in Q4'16 was broadly consistent with Q3'16 while gold production increased 32.4 per cent over Q3'16 due to the final processing of Phase 2 ore. Copper grades in Q4'16 were as expected as operations focused mainly on Phase 6 of the open pit. Oyu Tolgoi continues to deliver a strong environmental performance, achieving high water use efficiency – utilizing less than half the water per-tonne of ore compared to similar operations, and achieving recycling rates of 85 per cent. Oyu Tolgoi completed biological rehabilitation at 367.3 hectares land in 2016, and continued progress on a range of environmental programmes. Oyu Tolgoi also delivered strong progress in community initiatives, with two kindergartens and a school in Dalanzadgad, sport halls in Manlai operationalized, and 13 new sustainable development projects and programmes approved and implemented in 2016. A new bulk water treatment facility in Khanbogd was also completed and is scheduled to be handed over to the local community in April, 2017. The facility gives a significant boost to the community, with the capacity to provide services to 13,000 residents. Revenues in 2016 decreased 26.4 per cent to $1.2 billion against 2015 mainly reflecting lower copper prices and reduced gold sales, partially offset by higher gold prices. Concentrate sold in 2016 of 828,600 tonnes increased 1.1 per cent over 2015 reaching an annual high. Capital expenditure, on a cash basis, for 2016 was $326.3 million compared to $116.2 million in 2015, comprising amounts attributed to the underground project and open-pit activities of $226.8 million and $99.5 million, respectively. Open-pit capital expenditure includes deferred stripping of $30.9 million and tailings storage facility spending of $22.0 million. Oyu Tolgoi is expected to produce 130,000 to 160,000 tonnes of copper and 100,000 to 140,000 ounces of gold in concentrates for 2017. Open-pit operations are expected to mine in Phases 4 and 6 during the year. In addition, stockpiled ore will be processed during the year. The lower production when compared to 2016 is primarily the result of approximately one-quarter less copper head grade and approximately one-half less gold head grade. Capital expenditures for 2017 on a cash-basis are expected to be approximately $100 million for open-pit operations and $825 million to $925 million for underground development. Underground development capital includes both expansion capital and VAT. In an effort to encourage bidding by Mongolian suppliers, Oyu Tolgoi has incorporated longer tendering periods resulting in a slightly longer capital deployment process. The Company continues to expect production from the first underground draw bell in mid-2020 and first sustainable production beginning in early 2021. March 30 (MSE) Based on the provision 83.1 of Company Law and the provisions 8.1, 8.10.9 and 8.10.11 of the Charter of MSE, the "Guidance on Conducting Primary Market Trading of Government Securities" has been amended by the CEO's Order No. A-66 dated March 29, 2017. According to this amendment, the order placement time to buy Government securities has been extended until 11.30 am every Tuesday. March 30 (MSE) March 30 (MSE) "Khurd" JSC announced that the Board of Directors approved the distribution of MNT 102.1 million to its shareholders by a dividend of MNT 755 per share on February 16, 2017. The record date is February 15, 2017 and the dividend will be paid to the shareholder's account held at Mongolian Central Securities Depository before the end of second quarter of 2017. March 30 (MSE) "Aduunchuluun" JSC announced that the Board of Directors approved the return of MNT 378.1 million to its shareholders by a dividend of MNT 120 per share on March 3, 2017. The record date is March 24, 2017 and the dividend will be paid to the shareholder's account held at Mongolian Central Securities Depository before the end of second quarter of 2017. March 30 (MSE) "ARIG GAL" JSC announced that the Board of Directors approved the distribution of MNT 620 million to its shareholders by a dividend of MNT 17.82 per share on February 20, 2017. The record date is March 31, 2017 and the dividend will be paid to the shareholder's account held at Mongolian Central Securities Depository. March 30 (MSE) "Zoos Goyol" JSC announced that the Board of Directors approved the return of MNT 78.2 million to its shareholders by a dividend of MNT 6000 per share on February 13, 2017. The dividends will be paid in cash at the Company's headquarter for 60 days starting from February 13, 2017 and after 60 days the dividends will be placed in the shareholder's account held at Mongolian Central Securities Depository. March 30 (MSE) "JUULCHIN DUTY FREE" JSC announced that the Board of Directors approved the distribution of MNT 326.8 million to its shareholders by a dividend of MNT 5000 per share on March 17, 2017. The record date is March 28, 2017 and the dividend will be paid in cash at the Company's headquarter. 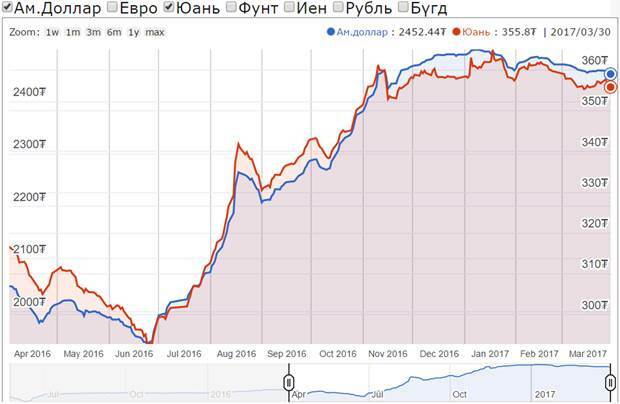 March 30 (Bank of Mongolia) Spot trade: Commercial banks bid weighted average rate of MNT2451.25 for USD0.4 million, asked weighted average rate of MNT2453.85 for USD14.6 million and bid weighted average rate of MNT350.60 for CNY19.0 million also asked weighted average rate of MNT357.60 for CNY1.0 million respectively. The BoM bought USD9.9 million with a closing rate of MNT2453.83. Swap and forward trade: The BoM received buying bid offers of USD 1.5 million of MNT swap agreements from commercial banks and the BoM did not accept the bid offers. Current and Capital account balance totaled to $56.6 million surplus, which is $64.5 million increase compared to the same period last year. The change was due to increase by 33% or $22.3 million in goods and services account, and decrease by 33% or $36.4million in primary income account creating deficit of $72.4 million. Financial account had a surplus of $208.7 million. In the first 2 months of 2017, Mongolia had a net lending of $208.7 million to the rest of the world, whereas in the same period last year it totaled to a net borrowing of $92.2 million. Thus, the net external financing had decreased by $300.9 million. As of the first 2 months of 2017, overall balance of payments deficit was $250.4 million. March 29 (Bank of Mongolia) Auction for 12 weeks maturity Government Treasury bill was announced at face value of 100.0 billion MNT. Face value of 100.0 billion /out of 123.0 billion bid/ Government Treasury bill was sold at discounted price and with weighted average yield of 16.875%. March 29 (MSE) Mongolia is expected to produce 40 tpy of gold by 2020, more than double the 18 tonnes it produced in 2016, according to Tumur Lkhagvador, Mongolia's ambassador to Singapore. Singapore, March 30, 2017 -- Moody's Investors Service has today confirmed the Caa1 long-term issuer ratings, the (P)Caa1 senior unsecured MTN program and the Caa1 senior unsecured ratings of the Government of Mongolia with a stable outlook. The short-term issuer rating was affirmed at Not Prime. Today's rating action concludes the rating review for downgrade that Moody's initiated on 15 February 2017. - Liquidity pressures have abated following the recent debt exchange transaction, assuming the staff-level agreement is ratified by the IMF Executive Board. Imminent default pressures have subsided. - However, fiscal and growth pressures are likely to remain higher than forecast at the end of last year, which could encourage a further rise in liquidity pressures over the next 12-18 months. The decision for a stable outlook on the rating balances the upside risk that IMF-related funding stabilizes Mongolia's external payments position until increased FDI and mining activity lift medium-term GDP growth and foreign currency revenues; against the downside risk posed by Mongolia's very large financing requirements over the next two years, for which it will continue to rely on both external and domestic financing. The stable outlook assumes that the IMF board's approval of the program is obtained, allowing, as a result, loans by other multilateral and bilateral institutions to be disbursed. The local-currency bond and deposit ceilings remain Ba3. The long-term foreign currency deposit ceiling remains Caa2, while the foreign currency bond ceiling remains B3. All short-term foreign currency ceilings remain Not Prime. These ceilings act as a cap on ratings that can be assigned to the foreign- and local-currency obligations of entities domiciled in the country. March 29 (Reuters) Japan has committed $850 million in loans to Mongolia as part of a bailout to help rescue the country's struggling economy, Mongolia's finance ministry said on Wednesday. Mongolia, landlocked between China and Russia, agreed to a $5.5 billion bailout from the International Monetary Fund (IMF) as well as other institutions and countries in February. The cash-strapped Asian country saw its economy grow just 1 percent last year, its lowest in seven years, and it has struggled to maintain the value of its currency and manage its debts following a collapse in foreign investment and a decline in commodity prices. The $850 million loan from Japan was agreed during a visit to Tokyo this week by the chairman of Mongolia's parliament, Miyeegombo Enkhbold, said an official at the Finance Ministry. Negotiations have not yet been completed, the official added. 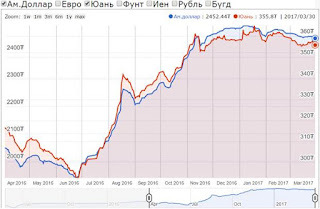 "This amount is almost equal to all soft loans provided by Japan to Mongolia since its transition to a democracy and market economy," said analyst Dale Choi at Mongolian Metals & Mining in a note on Tuesday. The loan comes in addition to the three-year IMF Extended Credit Facility worth $440 million, as well as an extension to a 15 billion yuan ($2.18 billion) swap line Mongolia's central bank has agreed with the People's Bank of China. Japan and South Korea, will provide up to $3 billion in aid, the IMF said in its February announcement. Lawmakers, however, must still act to ensure the bailout goes through when Mongolia's parliament reconvenes on April 5 after a recess. As part of the IMF deal, parliament is expected to vote on legislation that will generate revenue and reduce spending, with hikes in taxes and cuts in social welfare expected. Mongolia's pivot to Japan and South Korea for expanded trade and development is the result of its "Third Neighbor" policy strategy aimed at easing its dependence on Russia and China. Mongolia's has been one of the countries most affected by China's economic slowdown. Last year, Japan and Mongolia enacted a free trade agreement that grants zero tax on certain imports and exports, including Mongolian coal and cashmere. Ulaanbaatar, March 30 (MONTSAME) During the Cabinet's regular meeting on March 29, Wednesday, Prime Minister J.Erdenebat expressed concerns over the lingering process surrounding Erdenet Mining Corporation, an issue on which a working group led by Finance Minister B.Choijilsuren is currently working on. Last February, Parliament ordered the Cabinet to claim 49 percent ownership of Erdenet Plant, thus transferring the full ownership of the plant to Government of Mongolia. In the scope of the Parliament's resolution on Erdenet Mining Corporation, the Prime Minister instructed Head of Cabinet Secretariat J.Munkhbat and Head of Agency for Policy Coordination on State Property Ts.Nyam-Osor to form the Board of the corporation with all government officials in compliance with related laws and regulations, and furthermore ensure increased government representation in the administration of the corporation. Ulaanbaatar, March 29 (MONTSAME) "It's crucial to identify a leading sector, and frame a suitable policy on investment, concession and partnership between government and private sectors", experts highlighted during a meeting themed 'Recovering the economy by supporting domestic production' on March 28, Tuesday. Co-organized by National Development Agency, National Industrial Council and Confederation of Journalists for Industrialization, the meeting was participated by journalists and media delegates. During the meeting, National Development Agency introduced a road map on industrial development in the frames of which about 2000 of 6000 regularly operating factories in Mongolia have been united under an online system. The registration of domestic entities in process manufacturing will be completed within this year. Furthermore, National Development Agency and National Industrial Council established a memorandum of understanding to join hands on marketing domestic products, conducting an international market research and a study on adoption of innovative technology, and contributing to the framing of package law on cooperation between government and private sectors. Ulaanbaatar, March 30 (MONTSAME) The Cabinet discussed implementation of the Government Action Plan of 2016-2020 and decided to submit it to Parliament. Government ministries were assigned to develop a list of measures of which budgets were not reflected in the State Budget and formulate proposals to solve financing issues. March 29 (news.mn) The Mongolian Great State Khural (parliament) approved a 'Law on Deliberative Referendums' during the autumn session. In this connection, Ts.Tsolmon, State Secretary of the Office of Parliament has met Professor James S. Fishkin, director of Stanford's Center for Deliberative Democracy to discuss an agenda for implementing the law. Stanford's Center for Deliberative Democracy provided training on 'How to make a deliberative referendum?' at Mongolia's State House earlier today (29th of March). Ulaanbaatar, March 30 (MONTSAME) On March 29, J.Munkhbat, Head of the Cabinet Secretariat of Mongolia and members of the Investor Rights' Protection Council of Mongolia received a delegation led by Roberto Echandi, Investment Policy Global Lead of the Investment Climate Unit of the Trade and Competitiveness Global Practice of the World Bank Group. Trade and Competitiveness Global Practice of the World Bank Group and the International Finance Corporation have decided to co-implement a project to support investment policy and agricultural investment in Mongolia. At the meeting, the dignitaries exchanged views on issues of cooperation between the International Finance Corporation and the Cabinet Secretariat of Mongolia within the framework of intensification of works of investors and capacity building in the future. Mr. Roberto Echandi said "The reputation of Mongolia among investors has been slowly reviving. During an Investors' meeting held in Canada, international economists said that policy pursued by the government of Mongolia is being carried-out successfully and its activities are stabilized in recent times. One of the biggest examples is the recently-established Investor Rights' Protection Council of the government of Mongolia". He continued that I am glad to cooperate with Mongolia in this time when the country has a 'good' law regarding foreign investors. We will include Mongolia in specific into a report, which will be finally delivered to the European Union. J.Munkhbat said, in turn, that the government of Mongolia would like to revive investors' confidence in Mongolia and maintain mutually beneficial cooperation with the International Finance Corporation in the agricultural industry of Mongolia. He then pledged that the government will provide all possibilities to develop an action plan through an active operation of the relevant working group. "The government will pay attention to improve the working capacity of the Investor Rights' Protection Council" he added. Ulaanbaatar, March 30 (MONTSAME) During the Cabinet's regular meeting on March 29, Wednesday, Head of Cabinet Secretariat J.Munkhbat delivered a report on Prime Minister's working visit to western aimags. On March 22-25, Prime Minister of Mongolia J.Erdenebat visited Khovd, Gobi-Altai, Uvurkhangai and Bayankhongor aimags, meeting with the local people, and familiarizing with the operations of some entities and public organizations. The Cabinet assigned corresponding Ministers to urgently resolve certain issues forwarded to the Prime Minister, frame a follow-up action plan and take necessary measures. Ulaanbaatar, March 30 (MONTSAME) During its regular meeting on March 29, Wednesday, the Cabinet resolved to issue hay and fodder to some aimags; and ordered corresponding Ministers to allocate the required money from Government reserve fund, and see to the implementation of the resolution. Presently, a considerable amount of snow cover remains on the territory of Mongolia, leading to a difficult spring in 127 soums of 15 aimags. Therefore, the Cabinet settled that 1110 tons of hay stored in government reserve stations will be issued to herders free of charge in Uvurkhangai and Umnugobi aimags which have recently seen heavy snowfall, and 210 tons of fodder will be handed out with 50 percent discount. Ulaanbaatar, March 30 (MONTSAME) During its regular meeting on March 29, Wednesday, the Cabinet reviewed the 2017 land allotment plans of Citizens' Representative Khurals of aimags and the capital city. In 2017, 8013.52 ha area is scheduled to be granted to families and 39.39 ha area for agricultural use. 17 percent of the land up for family ownership is currently owned by the families, 74 percent will be owned newly and 9 percent is constituted by land to be allotted along national highways. 88 percent of agricultural land will be allotted for vegetable planting and the rest 12 percent will be used for other agricultural purposes; and no administrative unit has proposed land ownership for seed plants. Since 2003 when Law of Mongolia on Land came into effect, 17.57 percent of Mongolian population and 62.54 percent of the total households have claimed land ownership until 2017. Last year alone, 44 thousand people were granted ownership of 6109 ha land. Ulaanbaatar, March 30 (MONTSAME) A total of 729,645 citizens submitted requests, petitions and complaints to the state and local administrative bodies and officials in 2016. 98.2 percent of all inquiries were answered. The matter was discussed during cabinet's regular meeting held Wednesday. A report says 2,583 petitions were answered and settled overdue, most of which regarded the issues of housing, welfare and pensions. Heads of local, municipal and state administrations received complaints and requests from 495,111 citizens, 485,690 of which were answered and resolved. Local administrations of Darkhan-Uul, Dornod and Arkhangai aimags received the largest numbers of petitions and complaints, mostly concerning welfare, pensions, employment and land use. Ulaanbaatar, March 30 (MONTSAME) A report on traffic accidents was presented by the Minister of Road and Transport D.Ganbat at the regular meeting of cabinet held on Wednesday. Each year on average, 32,100 cases of traffic accidents occur, injuring 1,289 people and taking 558 lives, causing damage in value of MNT 10 billion. As for the last year, 73.5 percent of deaths in car crashes were recorded to have happened on countryside roads, 136 of whom were drivers and 149 passengers. In Ulaanbaatar, 84 out of 127 mortal victims in traffic accidents were pedestrians. Minister D.Ganbat presented this report while discussing the implementation of the the National Strategy for Ensuring Traffic Safety in 2012-2020. Associated officials and ministers were tasked to prepare proposals to the cabinet on renovating technological equipment in use by traffic police, making sure that police offices are able to monitor traffic outside the city, as well as on prohibiting imports of low quality vehicles and their spare parts. Since the enforcement of law on Traffic Safety, 1,782 cases of violation of the traffic regulations were recorded in 2016, which represents decrease of 11.3 percnet in regulations' violation, of 7 percent in death rate and 9.8 percent in injuries compared to the previous year's. Ulaanbaatar, March 30 (MONTSAME) During the Cabinet meeting took place on March 29, P.Gankhuu, Minister of Energy introduced a plan on supplying electric power in the tourism region of the western area of the Khuvsgul Lake. The Cabinet obliged to connect consumers in the western area of the Lake to the central electric power network within the framework of works to improve tourism infrastructure in the western part of the Khuvsgul Lake. The Cabinet also assigned Minister P.Gankhuu to complete the task before June 15. Most democracies, and quite a few non-democracies, have adopted broadcasting laws. At their best, these laws can promote a number of important social and human rights objectives. They can establish independent bodies to regulate broadcasting, so that this is not done by a ministry or another body which lacks independence from government. They can put in place a fair, competitive processes for obtaining broadcasting licences, ensuring a level playing field and promoting various public interest objectives through licensing (such as controlling undue concentration of ownership of broadcasters). They can establish various mechanisms to promote diversity in the broadcasting sector. And they can put in place appropriate systems for addressing harmful content in the airwaves or, put differently, for promoting professionalism among broadcasters. Mongolia, however, is an exception in this area, since it does not have a broadcasting law. This is not for lack of trying and both advocates and officials have spent many years promoting the idea of a broadcasting law, so far without success. As far back as 2002, I was a co-author of the publication Mongolia in Transition: Analysis on Mongolian laws Affecting Freedom of Expression, produced by Globe International and ARTICLE 19, which, among other things, recommended the adoption of a comprehensive broadcasting law. In 2009, the Asia-Pacific Institute for Broadcasting Development (AIBD) worked closely with the Mongolian National Broadcaster (MNB) to prepare a broadcasting law, but the resulting draft was never adopted. Following this, in 2013-14, the Asia-Pacific Broadcasting Union (ABU) worked closely with the Communications Regulatory Commission (CRC) to draft a broadcasting law which, again, was never adopted. In both cases, I was the international expert on the team. Mongolia does have a Law on Radio Waves, passed in June 1999, and a Law on Communications, passed in October 2001. The former establishes a general system for licensing the airwaves for both broadcasting and telecommunications activities, while the latter creates the CRC. However, CRC is not independent of government among other things due to the fact that the Prime Minister appoints the Chair and other members of the Commission, on the basis of nominations by the Minister responsible for communications. Furthermore, neither law provides for specific rules on broadcasting. As a result, these laws fail to promote the important potential objectives of a broadcasting law, noted in the first paragraph of this blog. In many respects, Mongolia represents an almost classical study of what happens in a country which, while a reasonably progressive transitional democracy, lacks a proper legal/regulatory framework for broadcasting. Because the regulator, the CRC, is not independent, it is not regarded as a legitimate decision-maker. This, in turn, seriously undermines its ability to make hard decisions. For example, a competition to determine which television stations would get access to the national, digital transmission network, held over one and one-half years ago, has still not been decided. The result is that the six legacy (historical) channels remain on the national network rather than this having been decided in a fair, competitive manner. More generally, instead of holding competitions for a limited number of broadcasting licences, based on what the country can reasonably support, licences were, at least in the past, issued to every bidder who met minimum technical standards (the so-called "fit and proper" test). Although some brakes have been put on this recently, the result has been a massive oversupply in the number of channels, many of which operate at a loss and with tiny audience shares. This, in turn, fractures advertising revenues and otherwise creates serious market distortions, making it very difficult for even the most popular channels to invest the resources that are needed to produce quality content. The lack of independence of CRC, combined with an inadequate legal framework, also makes it almost impossible to regulate content, whether in the form of enforcing positive obligations (such as a requirement for all channels to carry 50 percent Mongolian content) or professional standards (such as not to broadcast hate speech or content which is inappropriate for children during the daytime). This has significantly exacerbated the problem of low standards in broadcasting. Another problem is the absence of effective rules to promote diversity in the broadcasting sector. One measure which has been put in place is to require so-called "cable channels" (i.e. those which, in accordance with their licences, are distributed exclusively over cable networks) to concentrate 80 percent of their programming in the specialized area indicated in their licence, such as history, culture, education, news or sports. Even this rule, however, is widely ignored and rarely enforced. Otherwise, there are no rules limiting concentration of media ownership, promoting diversity through the licensing process or supporting the establishment of community broadcasters, all key diversity mechanisms in more developed broadcasting systems. In an important breakthrough, at the end of December 2016, the CRC did place a draft Broadcasting Law before parliament. This is significant because it represents a real opportunity to move forward on this issue. At the same time, as a recent Analysis of the draft Law by the Centre for Law and Democracy shows, there are significant problems with the draft. The first and perhaps most significant problem is that the draft Law does nothing to enhance the independence of the CRC. Indeed, it says nothing at all on this subject. Despite this, the draft Law grants very significant powers to the CRC, including to license broadcasters and to undertake the very sensitive task of applying content rules. The problems with independence do not stop there. The draft Law creates a Development Fund for National Broadcasting, with the worthy goals of improving the quality of Mongolian content, and funding priority and more costly content production. However, the draft Law also calls on the government to collect and set the rules for disbursing the Fund, both very politically sensitive tasks. The failure to promote the independence of the regulator is exacerbated by the fact that the term for broadcasting licences is set at the unrealistically short period of three years, whereas in almost every other jurisdiction this is at least seven years. The result is that every broadcaster will have to apply every three years to the politically controlled CRC for licence renewal. The draft Law also fails to establish even a framework of rules to ensure that licensing processes are fair, transparent and assessed on the basis of pre-established and legitimate criteria. The draft Law is also silent as to the question of how television stations get access to the highly coveted national distribution system, for how long and so on, leaving this to the sole discretion of CRC. In terms of diversity, the draft Law does include basic rules on concentration of ownership of broadcasters, although it fails to establish analogous rules regarding cross-ownership between the broadcasting and print media sectors. It also includes a very general call for quotas for Mongolian, local and licensee produced content, but the specifics are to be set by the CRC. While positive, it would have been preferable for the Law to include more detail on these important matters. Significantly, the draft Law entirely fails to recognize community broadcasting, which is never even mentioned. For example, the definitions recognize public and commercial broadcasting, but not community broadcasting. Finally, the draft Law establishes a number of direct content restrictions and then appears to leave enforcement of these rules to the CRC, mainly through the licensing process (i.e. by suspending or revoking licences for breach of the rules). Better practice in this area is to grant the regulator the power to adopt and then apply a detailed code of conduct for broadcasters, and to provide for a graduated system of sanctions, including warnings, a requirement to broadcast a statement acknowledging the breach and fines before the more serious measures of license suspension or revocation are invoked. To be fair, it is very positive that Mongolia appears to be moving forward with the adoption of a broadcasting law and, despite its shortcomings, the draft Law does contain a number of positive features. At the same time, given how long Mongolians have waited for this, it would be a lost opportunity if greater effort were not spent trying to improve the existing draft. The Analysis by the Centre for Law and Democracy provides a good starting point for such improvements. Toby Mendel is the Executive Director of the Centre for Law and Democracy (CLD), a Halifax, Canada based international human rights organization that focuses on foundational rights for democracy (freedom of expression, the right to information, freedom of association and assembly and the right to participate). He has worked on these issues globally and in countries around the world at CLD and, previously, with ARTICLE 19, for some 20 years. He also works with a range of inter-governmental organizations – including UNESCO, the World Bank, the OSCE and the Council of Europe – on these issues. Summary: The Speaker of Parliament, M. Enkhbold, is continuing his official visit to Japan. With enrollment in the IMF's extended fund facility program, Mongolia will receive an 850 million USD soft loan from Japan. The loan will have an interest rate of 1-1.5% and the loan will be interest-free for the first 10 years. Japan has granted over 3 billion USD in loans to Mongolia, 1 billion USD of which has been concessional loans granted since Mongolia's transition to a market economy. During the Speaker's visit, investors inquired about the economic diversification of Mongolia and asked for an increase in the number of flights between Ulaanbaatar and Tokyo. The Speaker of Parliament is scheduled to sign a medium-term agreement on strategic partnership. The Speaker noted that with the agreement's signing and implementation, cooperation between the two countries will develop further. Since the implementation of the Mongolia-Japan economic partnership agreement in June 2016, 8.2 million USD of products have been exported to Japan with reduced custom tariffs and over 300 product certificates of origin were approved. Summary: The Minister in Charge of Technical Regulation of the Eurasian Economic Commission, Valery Koreshkov, and other commission representatives are paying an official visit to Mongolia. The representatives met with agriculture industry experts and Minister of Food, Agriculture and Light Industry P. Sergelen. Members of the Eurasian Economic Commission are interested in importing meat and other agricultural products from Mongolia, and the meeting was held to introduce the standards and requirements of the commission's members. Koreshkov stated, "26 factories that produce meat and related products were examined and 10 factories received permission to supply beef, horse meat, sheep meat, and goat meat to members of the commission." Summary: Last month, commercial banks granted around 60 billion MNT in financing for ipotek loans to 909 applicants, an increase of 22% compared to January. In total, 90,000 households received ipotek loans totaling 4 trillion MNT. The majority of the loans (77%) were granted through the program to maintain sustainable ipotek financing, and 20% of them were granted through commercial banks. Of the total loans, 2.8% are overdue and 1.6% of the loans are non-performing. The average duration of the loans is 18.2 years and the average interest rate is 10.3%. Summary: New York and Toronto Stock Exchange listed Turquoise Hill Resources presented Oyu Tolgoi's 2016 financial report. In 2016, there were considerable developments in the underground mine's Shaft 2 and Shaft 5. Last year, Oyu Tolgoi's (OT) revenue reached 1.2 billion USD and the sale of concentrate reached a high of 828,600 tons. The production of ore and concentrate exceeded set targets. The number of employees of the underground mine exceeded 2,000 at the end of 2016, and 226.8 million USD has been invested in the development of the underground mine. In 2016, OT paid 68.1 million USD in royalties. OT plans to produce 130,000-160,000 tons of copper concentrate and 100,000-140,000 ounces of gold concentrate this year, and sales agreements for most of the mine's minerals have been made with buyers. Summary: The Financial Regulatory Commission (FRC) announced that it will now be possible to expand their cooperation with Japan's Financial Services Agency. With the renewal of their MOU, it will be possible to bring Japan's expertise and experience in securities and other finance sectors to Mongolia for study. The FRC noted that the renewal of the agreement is a huge step forward in bringing new financial services and products to the Mongolian market. Under the agreement, cooperation in human resource training will expand. Japan's Financial Services Agency is the regulatory agency for Japan's banks and non-banking institutions. The FRC first signed an MOU with the Financial Services Agency in 2014. Summary: In a meeting with Prime Minister of Japan Shinzo Abe, Speaker of Parliament M. Enkhbold proposed cooperating on building a factory complex to produce natural gas, replacement products for chemical products, and oil. The Speaker also asked the PM to look into the possibility of importing Mongolian copper, iron ore, and fluorite. Prime Minister Abe noted that once a technical and financial study and the necessary preparatory work for a factory complex is finished, it is possible to send a Japanese team to evaluate the project. Minister of Labor and Social Welfare N. Nomtoibayar requested assistance from Japan's Minister of Health, Labour and Welfare Yasuhisa Shiozaki to open a new hospital. During the Mongolian delegation's meetings in Japan, representatives discussed the possibility of sending Mongolian workers to Japan for training, ways to develop and support SMEs, and the possibility of raising capital from Japan's pension fund by releasing a Mongolian government-backed bond. Summary: Chair of the Cabinet Secretariat J. Munkhbat and Chair of the Government Agency for Policy Coordination on State and Property Ts. Nyamochir have received orders to form a board of directors for Erdenet Mining Corporation that is fully comprised of government officials, and to increase the number of government officials in management positions within the company. With the enactment of Parliament's resolution to transfer 49% of Erdenet Mining Corporation to state ownership, the government received a decree to implement the resolution. Prime Minister J. Erdenebat criticized the progress of the working group led by the Minister of Finance to carry out the order. Summary: The Mongolian Agricultural Commodity Exchange organized cashmere auctions in Sukhbaatar and Khentii provinces from March 24–28. Around 1,200 kg of cashmere valued at 114.2 million MNT was sold to traders through the auction in Sukhbaatar Province, equaling a retail price of 95,000 MNT. The price of cashmere has almost doubled compared to last year. In Sukhbaatar Province, cashmere is being sold for up to 94,000 MNT per kg, 100,000 MNT in Khentii Province, and 97,000 MNT in Umnudelger Province. According to the National Statistics Office, the country's number of goats reached 25.5 million at the end of 2016, an increase of 2 million compared to 2015. The Executive Director of the Mongolian Agriculture Commodity Exchange, Kh. Baatar, highlighted that the cashmere from Sukhbaatar, Khentii and Dornod province is high quality. Summary: In Ulaantolgoi, Dornobogi Province, located 5km from Sainshand, a wind park is set to be built. According to plans, the Sainshand wind park will be a 55 MW energy production facility. According to Renewablesnow.com, the European Bank for Reconstruction and Development (EBRD) is discussing the possibility of lending up to 30 million USD to the wind park's developers. The project is being developed by Sainshand Salkhin Park LLC, owned by French company Engie, IFU, Ferrostaal Industrial Projects, and a local partner. An estimated total of 117.5 million USD in financing is required for the project, and up to three banks can provide financing. Executive Director of Sainshand Salkhin Park LLC R. Davaanyam stated, "Construction is planned to start at the end of next month and there is a lot of work to be done before that." Construction is expected to take up to 18 months for the erection of 25 wind turbines with 2.2 MW capacity. The wind park is expected to generate 201 million watts per hour annually. Summary: State-owned Erdenes Tavan Tolgoi (ETT) has announced that has fully paid its debt to China's Chalco. On January 20, 2017, the management of ETT announced that the price for coal at the mine was increased to 71.5 USD per ton, and highlighted that with increased price, the debt it owed to Chalco could be fully repaid by April 1. The debt now paid is from the 350 million USD advance ETT received when it made an agreement in July 2011 to sell coal to Chalco. March 30 (gogo.mn) CEO of Erdenes Tavan Tolgoi JSC D.Ariunbold announced that the company paid off its USD 350 million debt to China's aluminum company, Chalco. Thus, the contract established in 2011 between the Chalco and the Government of Mongolia led by Prime Minister Su.Batbold has ended. Mongolia received US$ 250 million as prepayment of a loan from Chalco under the contract. However, the money was funded to Human Development Foundation and it granted to every citizen of Mongolia as monthly welfare of MNT 21 thousand. If the Government built coal washing plant by the prepayment of a loan, the benefit would be larger and broader. The previous authorities promised to export coal to the second and third markets (Japan and South Korea). However, it has not implemented yet. Mongolia paid off its debt to Chalco for six years in form of deliveries of coal from the East Tsankhi mine. According to the contract, it was agreed that the base price of ton of coal to be set at USD 70 and the price would be established seasonally based on the index price of 4 exchanges located in China. Form today, the East Tsankhi pit of the coal giant Tavantolgoi mine is finally getting into Mongolian people's full ownership. In other words, profit from coal mining in East Tsankhi will go directly to the Mongolian government budget. The East Tsankhi pit is projected to mine 11.5 million tons of coal this year which expects to bring US$ 550 million of revenue. March 30 -- RBR Group Limited's ("RBR") wholly owned subsidiary Futuro Skills and its local partner, Mongolia Talent Network ("MTN") which is part of The Shackleton Group have been advised they are the successful bidders in a tender to provide two packages of training and assessment services to employees at Rio Tinto's Oyu Tolgoi ("OT") mine in Mongolia. This landmark award is an entry point into one of the most exciting developments in copper and gold mining for several decades, the OT project managed by Rio Tinto. Based on currently identified reserves, OT is expected to operate for over 50 years, contributing to Mongolia's development and prosperity, and providing quality skills and learning opportunities to the more than 95% local workforce. The contract will begin with the training and development of between 60 and 120 supervisors and in-house trainers working for OT. Whilst this first stage of the contract will generate relatively small revenues these are expected to grow significantly with the ramp up of stage 2 development at OT. In May 2015, OT's shareholders agreed a plan to progress the next stage of underground development at Oyu Tolgoi, securing funding of US$4.4 billion. Construction work began in 2016. Rio Tinto have committed to invest US$126 million on technical and further education for their expanded workforce as the multi-billion-dollar Stage 2 development at OT ramps up. RBR's CEO, Richard Carcenac said: "This first contract supporting resources giant Rio Tinto is an important step in the global roll-out of our skills training business adding to existing contracts both completed and ongoing in Mozambique and Australia. We are pleased to be working with The Shackleton Group's subsidiary MTN, the longest-established international recruitment services business in Mongolia". Ulaanbaatar, March 30 (MONTSAME) During the cabinet meeting held on Martch 29, J.Munkhbat, Head of the Cabinet Secretariat of Mongolia introduced the implementation progress and future actions regarding a project of electric power transmission line and sub-station between Baganuur-Ulaanbaatar. In accordance with this, the Cabinet obliged to re-negotiate the concession contract with entities interested in the project implementation and to present the draft agreement of this project to the Cabinet meeting. Even though the Ministry of Energy announced a bid for the project in January 2016, no company that meets the criteria was available. March 30 (gogo.mn) On Mar 30th at 8 a.m, Mongolian civil aviation sector launched seven new air routes. According to the "Government policy on civil aviation until 2020", Mongolian civil aviation sector set to implement Performance-based navigation (PBN) procedures with three phases. The launch of seven new air routes was the second phase of the implementation of PBN procedure. 1. reduces the need to maintain sensor-specific routes and procedures, and their costs. 2. avoids the need for developing sensor-specific operations with each new evolution of navigation systems, which would be cost-prohibitive. 5. facilitates the operational approval process for civil aviation authorities by providing a limited set of navigation specifications intended for global use. Previously, Mongolia was using three PBN routes and today it has increased to 10. As estimated, the new PBN routes to reduce carbon dioxide emitting by transit air crafts by 5220 tons, shorten 230 thousand kilometers route and save 1,600 tons of fuel. March 30 (Lehman Law) The Excise Tax Law was adopted by the Mongolia Parliament on June 29, 2006 and became effective from January 1, 2007. The law has been amended several times and has been the subject of a Supreme Court interpretation in 2007. The law's purpose is to establish parameters with respect to imposing excise tax on goods, whether imported or locally manufactured, as well as on special purpose apparatuses and equipment utilized for individuals and legal entities engaged in the paid quiz or gambling games. The excise tax is also imposed on activities of individuals and legal entities engaged in paid quiz or gambling games and on equipment used for such games, such as gaming tables or electronic wheels, automatic games, cashier devices or devices which calculate and display gaming results or keeps track of bids. The excise tax to be imposed on goods, other than spirits distilled in Mongolia, are due before 25th of each month, in advance. Excise taxpayers are the individuals and legal entities which import and sell the goods as described above, and those which engage in activities of paid quizzes or gambling games. In the event goods subject to the excise taxes are donated or transferred to another party free of charge, as well as when used internally by an individuals and or legal entity, an excise tax shall be imposed. An excise tax equal to MNT 36,250,000 (approximately US$ 14,800) per month, is imposed on the activities of individuals and legal entities which operate paid quizzes or gambling games via cyber, internet or mobile networks. The some goods are exempted from excise tax under the law, such as goods produced within the territory of Mongolia solely for export; Mongolian traditional home-made liquor distilled from milk for household use; snuff tobacco; legally obtained and imported duty free alcohol and tobacco; dual-fuel cars; cars running on liquefied gas; and electric cars. The recent amendments to the state budget include provisions to increase excise taxes on gasoline and diesel fuel. The excise tax on passenger cars will be increased based on the vehicle's engine capacity. The excise tax on alcohol, excise tax on cigarettes, and customs tax on cigarettes will also increase. If the amendment is approved by the Parliament, these proposed excise tax increases to take effect on April 1, 2017. March 30 (International Road Transportation Union) A trade revolution along the Asian Highway network – connecting China and Russia via Mongolia's key transport corridors – is the focus of a series of TIR training workshops in Ulaanbaatar, jointly organised by the National Road Transport Association of Mongolia (NARTAM) and IRU. The meetings reinforce Mongolia's active steps to eliminate transit barriers, reduce delivery times for overland transport, and expedite the region's potential for more trade in the future – as outlined in the recent Intergovernmental Agreement on International Road Transport signed by China, Mongolia and Russia and reinforced by China's accession to TIR. "In order to implement the trilateral Intergovernmental Agreement, the use of the adopted, internationally recognised TIR system is the most efficient means and the best way forward. We do not need another mechanism to facilitate regional transport." The China-Mongolia-Russia corridors referenced in the Agreement connect the three countries via central and western Mongolia, and provide Mongolia with sea access via one of the routes. The network is among the strategic trade corridors highlighted in China's One Belt One Road framework as well as Mongolia's Steppe Initiative, connecting the East Asia economic circle with Europe. Mongolia's Ministry of Road and Transport Development and Customs General Authority will meet with IRU in parallel to exchange views on how to improve the country's transport and transit systems. The TIR training workshops, where IRU will engage with customs officials, representatives of the domestic transport industry and transport operators, to raise awareness on TIR and to improve the framework conditions for its use, will lay solid foundations for more cross-border traffic between the three countries. IRU Secretary General, Umberto de Pretto, commented, "By reinforcing the Asian Highway network, Mongolia's trade potential will become ever more strategic to the sustainable development of the region. With China implementing TIR, regional connectivity will be significantly enhanced, benefiting international trade and hence generating economic growth." China became the 70th contracting party of the TIR Convention and IRU is now actively supporting the competent authorities in China to implement the system. Once operational, Mongolia, Russia and China will start to enjoy the benefits of the TIR system. TIR requires minimal manpower and facilities – other than that for checks on seals and the inspection of load compartments or containers – reducing transit delays and congestion at border crossings. This saves significantly on transport costs, leading to increased competitiveness and growth. TIR's "single transit document" also reduces the risk of presenting inaccurate information and only approved transporters and vehicles can operate. March 29 (ServiceNow) Mongolia's largest commercial bank, Khan Bank, understands the challenge of providing banking services in a sparsely populated and widely dispersed region like Mongolia. Arvin Joshi, Khan Bank CIO noted that a lack of automation in IT processes is an obstacle to the company as it tries to change the way they manage IT services. This case study describes the challenges faced by the bank as it moves improve the automation of IT services to meet the needs of customers and staff. March 30 (Embassy of Mongolia) The Mongolia London Business Forum organized by the Mongolian-British Chamber of Commerce is going to be held on 5 April 2017 in London at Bloomberg Headquarters. Over 200 government and private sector representatives, scholars and researchers will attend the Forum. The State Secretary of the Ministry of Foreign Affairs and IMF Resident Representative in Mongolia will make keynote speeches on the current economic and investment environment of Mongolia, the Government policy and its objective toward improving the investment opportunities as well as provide overview on bilateral co-operation between Mongolia and IMF. Panel discussions on "Investing into Mongolia" and "Doing Business in Mongolia" will be held during the Forum. March 29 (gogo.mn) 7th edition of Mongolia Mining international exhibition will be held on Apr 5-7 at Buyant Ukhaa sports palace. The Mongolian Mining international exhibition is the most significant event in the mining industry. The expo is being organized by Ministry of Mining, Mineral Resource Authority of Mongolia Mongolian National Chamber of Commerce and Oyu Tolgoi LLC. Traditionally, Minex Mongol LLC and Erdenes Mongol SOE are jointly organizing the expo. Transwest Mongolia LLC, the official distributor of Komutsu brand is serving as a platinum sponsor of the expo, Wagner Asia Equipment LLC, the official distributor of Caterpillar is serving as a gold sponsor and Gan Tumur International LLC is serving as an event sponsor. 130 companies from 16 countries are attending Mongolia Mining 2017 expo. In addition to domestic and foreign-invested companies that operating in Mongolia, mining suppliers from Australia, USA, Russia, Japan, China, Canada, India, Turkey, Netherlands, Sweden, Kazakhstan, the Czech Republic, Belarus, Germany and South Korea is gathering under one roof and promote their products. Leading supplier companies of mining equipment including Transwest Mongolia LLC, Wagner Asia Equipment LLC, United Belaz Machinery LLC, Gantumur International LLC, Minelab Electronics Pty Ltd, Mitsubishi Materials Trading Corp, Scantech International Pty Ltd, Czech Mining Companies, Wika Kazakhstan Ltd, Atlas Copco Mongolia LLC, Proffesional LLC, Mekhlopat and Magnai Trade LLC will exhibit their products at the expo. Supporters of the expo including The Ministry of Mining and Mineral Resource Authority of Mongolia, Erdenes Mongol SOE, Erdenes Tavan Tolgoi JSC, Erdenet Mining Corporation, Baganuur JSC, Shivee-Ovoo JSC and Oyutolgoi LLC Mongolia Mining 2017 will make presentation on ongoing projects, procurement procedures, and requirements. Mongolia Mining expo aims to bring the latest mining technologies close and is open to mining, road construction, and heavy industry sectors as well as everyone who aims to build business relationship with expo participants. Visitor registration for the expo is available now at www.mongolia-mining.org. Also, visitors are able to be registered at the main gate of the expo. Free buses for exhibitors and visitors will depart from Bayangol and Shangri-La Hotel every hour. Welcome to the Mongolia Mining 2017 international mining expo! The business delegation includes the top officials of open and underground mining equipment producer and service providers such as horizontal and vertical transportation, alarm security, transmitting belt, communication techniques, trolley, electric security measurement, operational techniques, coal ash and oxygen measurement analyzator and so on. Ulaanbaatar, March 29 (MONTSAME) According to a report of Ministry of Food, Agriculture and Light Industry of Mongolia, livestock death toll reached more than 180 thousand nationwide or 0.3 percent of the total livestock population of Mongolia, which is calculated to have decreased by 50 percent compared to the previous year. The reports revealed that it is estimated that over 20 million dams were counted and out of that, some 1.7 million dams have delivered their offsprings on a national level, as of today. Currently, about 40 percent of the total territory of Mongolia is covered in snow, especially Uvurkhangai, Uvs, Khuvsgul and Bayankhongor aimags are in deep snow. The Ministry of Food, Agriculture and Light Industry and the National Emergency Management Agency warned herders and residents of rural areas to prevent from high risks of 'spring flood', which is expected following a warm weather in areas where too much snowfall is experienced. Ulaanbaatar, March 29 (MONTSAME) National Air Traffic Service is planning to hold the very first training for drone operators on March 31. To maintain safety in operating drones, registration work of drone operating individuals and organizations started in 2016. Within the framework, 22 people will be attending the training. Drones are widely used around the world in industrial, agricultural, ecological and media sectors. The increasing demand of drone usage is now raising safety issues. Therefore, the training will include guidance on aerology, Mongolian climate attributes, flight safety, human factors and specialized flight zones. Drone operators without any proper knowledge of emergency flight suspension, climate, safety and human factor can harm buildings, people and animals as well as violate Civil Code and Aviation Regulations. The training will provide theoretical, regulatory and safe operating educations for drone operators. On the side note, National Air Traffic Service will be taking legal actions against drone flights in unauthorized area in the future. (Cardno) is seeking Water Resource Management Specialists with experience in Mongolia and/or Central/East Asia. Cardno Emerging Markets USA, Ltd. (Cardno) is seeking Water Resource Management Specialists with experience in Mongolia and/or Central/East Asia, with a focus on water supply infrastructure and sanitation. Proficient in English including speaking, reading, and writing. Working capacity in Mongolian preferred. Asian Development Bank (ADB) is currently seeking applications from the eligible applicants for the post of Senior Portfolio Management Specialist in Ulaanbaatar, Mongolia. The Senior Portfolio Management Specialist will support effective project management, both advising on effective processing, and on project administration. Contribute to reviews and development of ADB policies, guidelines, instructions, processes and other related exercises. Ensure optimal use and application of project management and reporting systems (e.g., eOps), including quality assurance of data entry, and timely updates, as required. Liaise closely with donors for projects financed from trust funds (e.g. JFPR, Korea eAsia Fund), providing regular portfolio updates, in coordination with Office of Cofinancing Operations. Ensure that MNRM's annual program for project completion reports (PCRs) and technical assistance completion reports (TCRs) meets the annual target with quality reports. Ensure quality and consistency of reports and outgoing communications related to the MNRM's project-related activities. Coordinate efforts in strengthening capacity of project executing and implementing agencies in project implementation, including project accounting, disbursement and procurement procedures. Inspect quality of project field operations, with focus on problem or potential problem projects. March 31 (GoGo Mongolia) Decreased clouds in Ulaanbaatar city and no precipitation is expected. Winds from NW will reach 5-10 m/s. Temperature will reach 11C to 13C today. Warm days expected in most regions in the coming days. Mostly cloudy in Western aimags. Decreased clouds in other regions. No precipitation is expected. Winds from W in Western aimags, NW in other regions will reach 5-10 m/s and it will reach 14-16 m/s in Altai branch mountains. Temperature wlll be 1C to 6C in Khuren belchir, 1C to 6C in Darkhad hollow, Khangai, Khuvsgul mountainous areas, Yuruu river basins, -2C to 3C in Uvs lake hollow, Ider, Tes river basins, 12C to 17C on Gobi aimags and 8C to 13C in other regions. March 30 (gogo.mn) We Mongolians have just started to focus on lead poisoning in children which banned in the United Stated half-century ago. Americans banned the use of leaded gasoline and stopped using leaded paint in schools since 1970 when they found out that the lead directly affects intelligence quotient of children. In addition, Americans conducted a survey to determine the level of lead in children blood for 30 years. A survey conducted in Boston in 1979 revealed the impact of lead on the development of human brain. The survey has involved 249 infants determining their blood lead level at their 6, 12, 18, 25 and 57 months. Of which 148 of them were re-tested 10 years later and 43 of them were re-tested 20 years later. Thereafter, the survey participants were tested to determine the intellectual level. As a result, thinking skills of people who had the high level of lead in blood at their childhood were low compared to those who had the low level of lead in their blood. In addition, the blood lead level at their 4-10 years was found to have the most influence. In other words, it is significant to prevent children at these ages from lead. HOW IS THE BLOOD LEAD LEVEL FOUND IN CHILDREN LIVING IN THE CITY? Mongolia started to conduct surveys on the lead poisoning just in recent years. Scientists conducted several surveys on children to determine their blood lead level since 2000. According to the 2005 survey, an average lead level found in blood of 1-6th graders were 5.39 µg/dl. According to the World Health Organization, there is no known safe blood lead concentration. But it is known that, as lead exposure increases, the range and severity of symptoms and effects also increase. Even blood lead concentrations as low as 5 µg/dl, once thought to be a "safe level", may result in decreased intelligence in children, behavioral difficulties, and learning problems. In Feb 2017, GoGo News Agency and Mongolian National University of Medical Sciences conducted blood test on lead involving 15 children aged 7-10 years who are living in 5 different areas including Da khuree technical market, Bayankhoshuu, city center, Narantuul market, and Zaisan. The test result was interesting. 5,7-22 µg/dl lead in blood was found from the children living near Da Khuree technical market and Bayankhoshuu, while no lead was found from the child living in Zaisan. WHY NO LEAD WAS FOUND IN CHILD LIVING IN ZAISAN? That question is followed by many issues. In scope of series reports, we raised a hypothesis that why child living in Bayankhoshuu and Da Khuree has the highest level of lead in their blood. Air pollution level is considered safe when air quality index is 50 while air quality index value over 500 represents the hazardous level, according to the Mongolian National Air Quality Standard (MNS 4585:2016). If human breathes hazardous level of air for 24 hours, it will cause oxygen-deficiency in human body. A child living in Bayankhosuu is being poisoned from lead-containing coal, fine particulate matter and lead-containing blue water cans while car oil, automotive battery, leaded gasoline and soil pollution is the reason why child living in Da Khuree technical market has the high level of lead in blood. However, air quality index of Zaisan areas ranges between 21-300 in winter which, reaches 500-2000 in Bayankhoshuu every day. Moreover, lead contamination in soil of Khan-Uul district is low compared to other districts. In other words, Zaisan has the cleanest air and soil which might be the reason why no lead was found from a child living in Zaisan. According to the study conducted by Institute of Geography and Geoecology, lead concentration was high in soil of Sukhbaatar, Bayanzurkh and Songinokhairkhan districts. A national standard for a safe level of soil lead is 100 mg/kg. However, the maximum level of soil lead in districts is ranging between 390-2413 mg/kg. Khan-Uul and Chingeltei districts have a safe level of soil lead, which amounts 45-110.50 mg/kg. Another survey shows that soil lead exceeds two times the standard near auto repair centers. Scientists believe that rising ger-district, vehicles, and consumer products are the main cause of increase in soil contamination. We mentioned earlier about the negative effects of lead on children`s brain development. During 2012-2016, children`s nervous system disorders were as follows. Health Development Center reports 761 children in Songinokhairkhan district, 735 children in Bayanzurkh district, 256 children in Khan-Uul district were suffering from nervous system disorders in 2016. Nervous system disorders have rapidly increased in Songinokhairkhan and Bayanzurkh districts. In 2013, total of 498 children suffered from nervous system disorders in Songinokhairkhan district, but this number rose to 761 after three years. Nervous system disorders were relatively low in Khan-Uul district compared to other districts, but it has doubled in just four years. The neurological disorder is popular among children living in Songinokhairkhan and Bayanzurkh districts where the lead concentrations in soil are high. Of course, this conclusion should be set based on many factors, including population, population growth, and livelihood. Here we note that it is not a research, it is a hypothesis raised by a reporter. As lead concentrations in the blood increases by 10 µg/dl, children's intellectual potential is reduced by 1-5 score and there are changes in perception and attitude. Thus, we have decided to name lead as a "brain eater". Some scientists say that children are more likely to become criminals in the future due to negative effects of brain eater. Only few research companies and researchers noticed that the lead is threatening our children`s future. However, the Ministry of Health and government agencies are not taking this issue into account. GoGo News Agency sent the test result to the Ministry of Health and requested to take a wide range of research and analysis. However, we have not received any response to the request so far. Moreover, nobody cares for the health of people and children living near Da Khuree technical market. Even, a new market located in the outer part of the city has commissioned and order of the City Mayor to move the Da khuree technical market has issued, it has not moved out of town until today. Seeminlgy it can be said as officials are less concerned of how children's health is being affected by environmental pollution. The Government urgently needs to conduct blood lead test among all children of the nation and determine the reason for the high lead level in blood as well as to find out solutions. March 31 (GoGo Mongolia) In Feb 2017, GoGo News Agency and Mongolian National University of Medical Sciences conducted blood test on lead involving 15 children aged 7-10 years who are living in 5 different areas of the Ulaanbaatar city including Da khuree, Bayankhoshuu, Narantuul market, City center and Zaisan. The test results were interesting. Bayankhoshuu is located in Songinokhairkhan district which covers total of 1200,6 km2 areas and has 82,895 households. However, only one-fourth of the households are living in apartment. Da khuree technical market is located in Bayanzurkh district where more than half of households live in ger district too. Also, the area is crowded with auto repair centers and washing centers. Households living in ger district burn raw coal to survive harsh winter which resulting hazardous levels of air pollution almost every day throughout the winter. Scientists reveal that ash from a coal contains lead. The test reveals that the child living in Bayankhosuu is being poisoned from lead-containing coal, fine particulate matter and lead-containing blue water cans while car oil, automotive battery, leaded gasoline and soil pollution is the reason why child living in Da Khuree technical market has the high level of lead in blood. Zaisan, a new residential area for upper-class people is located in Khan-Uul district, on the bank of Tuul river and bottom of the Bogd mountain where it has the cleanest air all year round. Apart from lead-containing ashes, lead was found in soils of the city. According to the study conducted by Institute of Geography and Geoecology, lead concentration was high in soils of several districts which have the highest number of ger district households. Also, Zaisan has the cleanest soil which amounts 45-110.50 mg/kg. In other words, Zaisan has the cleanest air and soil which might be the reason why no lead was found from a child living in Zaisan. Lead-containing air and soil resulting negative impacts on children`s brain development. Health Development Center reports 761 children in Songinokhairkhan district, 735 children in Bayanzurkh district, 256 children in Khan-Uul district were suffered from nervous system disorders in 2016. The neurological disorder is popular among children living in Songinokhairkhan and Bayanzurkh districts. Mongolian research companies and researchers conducted survey on the lead poisoning since 2010, which threatening our children`s future. However, the Ministry of Health and the Government are not taking this issue into account. GoGo News Agency raised the issue again in Feb 2017 appealing to take a wide range of research and analysis. The Ministry of Health and the Government are still not responding. Seemingly, it can be said as officials are less concerned about how children's health is being affected by environmental pollution. ULAN BATOR, March 29 (Xinhua) -- China's Belt and Road Initiative is a great investment opportunity for Ulan Bator, capital of Mongolia, the city's mayor said Wednesday. The Belt and Road Initiative, proposed by China in 2013, aims to build a trade and infrastructure network connecting Asia with Europe and Africa along and beyond the ancient trade routes. In an exclusive interview with Xinhua, Batbold Sundui said he expects Ulan Bator to play an important role in connecting Mongolia's Steppe Road program and the Belt and Road Initiative. Batbold highlighted the capital's favorable geological location in the construction of an economic corridor linking China, Russia and Mongolia aimed at boosting transportation connectivity and economic cooperation in border regions. "As a mayor, I meet with representatives of Chinese enterprises almost every day. Chinese enterprises comprise the largest proportion of foreign enterprises in Ulan Bator," Batbold said. Batbold praised Chinese construction companies participating in Mongolia's road and infrastructure development projects for their professionalism and bringing the latest technologies to Mongolia. Chinese enterprises will start work on new airport highways, city bridges and suburban road construction and the re-development of slum districts in Ulan Bator as spring arrives, Batbold said, adding that all these investments will change the city's future. Besides, Batbold said Ulan Bator is adopting measures to woo foreign investment amid concerns from foreign investors sparked by Mongolia's deep economic crisis and foreign debt burden since the second half of 2016. The city government has set up a council to protect the rights of foreign investors and help them become better informed about Mongolia's complicated laws and regulations, the mayor said. As Mongolia's largest city, Ulan Bator is home to 1.38 million people or close to half of the land-locked country's population and accounts for 60 percent of its gross domestic product. March 29 (what3words) When you live in the city, you often end up going to all the same places, instead of discovering new ones. When your city is notoriously difficult to navigate, and is also the coldest capital in the world, this is especially true. Why wander around outside searching for a new bar, when you could already be sipping a pint in one you already know? Ulaanbaatar Passport encourages local people to explore more of the Mongolian capital. It's a pocket-sized guide to Ulaanbaatar's best cafes, bars and restaurants, with exclusive deals and discounts for each location. Designed to resemble an actual passport, each page represents a 'visa' to a different handpicked bar, which passport-holders present to redeem their discount and receive a stamp. Ulaanbaatar has few street names, and no consistent numbering system. The lack of structure means it's hard to tell where one street ends and a new one begins, and most people get around by referring to landmarks around the city. This is particularly difficult at night, and only gets people to a rough area, rather than a specific place or entrance. Ulaanbaatar Passport now displays a 3 word address for every listing. These are accurate to 3m x 3m, directing passport-holders directly to the entrance of the place they're looking for. More people exploring the city means local businesses get a welcome boost, and a night out in Ulaanbaatar is now a more comfortable experience, with no need to wander around in sub-zero temperatures searching for a particular bar or restaurant. March 29 (news.mn) Ulaanbaatar Mayor S.Batbold, has announced that the operation of a quarry next to the River Tuul is to cease. The ban comes into immediate force from today (29th of March). It is considered that the existence of the quarry next to the river, which flows through the heart of the Mongolian capital, contravenes the rights of citizens. A total of eleven companies based along the banks of the River Tuul will be effected by this new law. In 2016, Mongolian law enforcement officers suspended the operational permits of four companies and imposed fines in excess of MNT 20 million for re-cultivation. March 30 (UB Post) Ger Community Mapping Center is presenting "Tale of Two Cities", a two-week exhibition with workshops at Nogoon Nuur Park in Chingeltei District. An opening reception for the exhibition is taking place on April 1, from 4:00 p.m. to 8:00 p.m. The exhibition is the result of Ger Community Mapping Center's collaboration with local and international artists to showcase and unveil the hidden gems of living in Ulaanbaatar. The setting for the exhibition, Nogoon Nuur Park, is one of those gems. The park is a former stone quarry and dumpsite that has been full rehabilitated to become a safe and clean green space for public use. The contributing artists were asked to create work that reflected on two key questions: what does the future hold for the residents of Ulaanbaatar, and can we unite the residents of the city to solve problems together? The exhibition is one of a kind and will include maps, photography, illustration and felt-based art by Mongolian felt master Baasansuren Alyeksandr, U.S. cartoonist Marc Parenteau, and British photographer Billy Macrae. "Tale of Two Cities" will engage people from all walks of life and hopes to bring communities together to find ways to creatively solve urban issues. Visitors will be treated to a dynamic three-dimensional and interactive exhibition, and a series of hands-on workshops on April 8 and 9 will give visitors a chance to explore and experience mapping, photography, illustration, and felt making. The exhibition will be open from 10:00 a.m. to 9:00 p.m. from April 2 through 14, and is free and open to the public. A map to the park can be found on the event's website, t2cities.com, with information about the exhibition available in Mongolian and English. Ger Community Mapping Center's guided ger district tour will be available during the exhibition, introducing visitors to some of the creative, commercial, and environmental initiatives taking place in the city's ger districts. From April 2 through 14, the final stop on the tour will be Nogoon Nuur Park. March 30 (Jiji) Foreign Minister Fumio Kishida and visiting Mongolian counterpart, Tsend Munkh-Orgil, have signed a bilateral action plan for 2017-2021, including cooperation in the political, security and economic fields. "I hope to promote relations between the two countries in a mutually beneficial and strategic way," Kishida said in his Tokyo meeting with Munkh-Orgil on Wednesday. Kishida also expressed hope of collaboration with Mongolia on other issues, including North Korea's abductions of Japanese nationals. The action plan states that Tokyo and Ulan Bator will demand that North Korea completely abandon its nuclear arms and missile programs and abide by U.N. Security Council resolutions. The plan also confirms Mongolia's support for Japan's aim of resolving the abduction issue. On the economic front, the plan calls for the implementation of a free trade bilateral economic partnership agreement that took effect in June last year, and improving the investment environment. Ulaanbaatar, March 30 (MONTSAME) On March 28, Midterm Program on Strategic Partnership of Mongolia and Japan was signed by Foreign Affairs Ministers of the two countries, Ts.Munkh-Orgil and Fumio Kishida. The event was held within the official visit of Parliamentary Speaker M.Enkhbold to Japan. Mr. M.Enkhbold underlined the event as remarkable in a 45-year history of cooperation between Mongolia and Japan and said that Mongolian government would pay significant attention for successful realization of the Midterm program, which covers all sectors of the cooperation. Japanese Minister Kishida noted that with this document the two countries have confirmed again that the traditional friendly relations would be developed and widened further. The program contains goals and principles of next five year on widening the bilateral cooperation in all spheres, including politics, trade, economy, investment, security, defense, culture, education and humanitarian. "- Mutually beneficial trade and economic relations will be priority. Particular attention will be given to agriculture, using natural resources, including developing huge coal resources with Japanese high technology and selling it at international market and to world level education of Mongolian youth. We also emphasize to export Mongolian agricultural and products of animal origin to Japanese market based on the Economic Partnership Agreement" said Foreign Affairs Minister Ts.Munkh-Orgil to journalists. Prior to the program signing ceremony, the Foreign Affairs Ministers held official talks and Foreign Affairs Minister of Japan Kishida paid courtesy calls on Speaker M.Enkhbold. March 29 (Kyodo) Japanese Foreign Minister Fumio Kishida (R) and his Mongolian counterpart Tsend Munkh-Orgil shake hands before holding talks in Tokyo on March 29, 2017. Japan and Mongolia agreed to cooperate in pushing North Korea to abandon its nuclear and missile development programs. Ulaanbaatar, March 29 (MONTSAME) On Tuesday, March 28, Minister of Health, Labor and Welfare of Japan Yasuhisa Shiozaki and Chairwoman of Japanese "Ethics Aassociation" K.Ito paid courtesy calls on Parliament Speaker M.Enkhbold. Speaker M. Enkhbold talked about two main issues, after briefing on meetings and discussed issues during his visit to Japan. The two concerned issues were sending trainees from Mongolia to Japan as well as a possibility of raising capital using Japanese pension fund through issuing Government bond of Mongolia. The capital would be spent on providing middle income citizens with apartment, developing small and medium enterprises and creating jobs. Minister Ya.Shiozaki said "- I am one of the initial implementers of the trainees' project. We will be pleased, when trainees come from Mongolia to obtain high professional skills and dedicate their learned knowledge and skills to the development of the country. Our pension fund is considered one of biggest in the world and the fund's activities should meet the interest of Japanese people as the fund is a guarantee of wellbeing of Japanese pensioners. A special fund could be created to buy securities of a foreign country and used, but Mongolia should get guarantee by organizations like World Bank, as it is a developing country". MP and Minister of Labor and Social Welfare N.Nomtoibayar attended the meeting and informed on preparation works to send trainees, which include to establish representative office in charge of trainees in Japan, develop bills to amend relevant laws and teach Japanese language and culture to students of vocational schools. "- We are studying to implement a project to build clinical hospital with 300 beds available for 15.000 patients annually and ambulatory with a capacity of 350.000 persons. We consider it important to introduce Japanese management to the hospital, have Japanese specialists, utilize Japanese equipment and facility and train physicians and specialists in Japan. We request the Minister to pay attention to it" Minister N.Nomtoibayar said. Ulaanbaatar, March 30 (MONTSAME) Yesterday, Parliamentary speaker M.Enkhbold and accompanying delegates, including members of the Parliament and the Government, who are on a visit to Japan met with the authorities of the International Friendship Exchange Council. The Council, founded in 1983, has over 1000 members comprising of Japanese big companies, research institutes and universities. It established relations with Mongolia in 1988 and runs activities to strengthen friendship, develop economic ties and to increase investment amount from Japan to Mongolia. Speaker M.Enkhbold said "- Realization of cooperation agreements and programs that were agreed by the two sides, widening mutually beneficial trade and economic cooperation and implementing new joint project and programs will fully satisfy interests of the two countries, businessmen and citizens. Our government endeavors to make business environment more flexible, diversified and favorable without burdens". President of the Council K.Matsuzawa said that members of the council have sincere heart to contribute to the development of Mongolia and wellbeing of Mongolians. "Mongolians are not only our friends, but also our brothers and sisters" he noted. During the meeting, the attendants expressed their opinions about what should do to recover Mongolian economy and what sector should be prioritized. After the meeting, Speaker M.Enkhbold visited the National Center for Global Health and Medicine Hospital. The Speaker highlighted "- It is important for us to learn from management, organization, treatment methodology and activities of Japanese health institutes, to train Mongolian specialists and introduce high technology equipment and facilities. Therefore widening bilateral cooperation in this sector is in the center of government policy". In Japan, hospitals and clinics receive 7 million calls for medical aids in a year nationwide, of which 700 thousand in Tokyo. The hospital receives 11000 calls in a year, leading the others in Tokyo. Ulaanbaatar, March 30 (MONTSAME) Delegates led by Valery Koreshkov, Commissioner for Technical Regulations of the Eurasian Economic Commission are visiting Mongolia between March 27 to 31. The delegates, during their visit in State Central Veterinary Laboratory and meat producing factories, have expressed their recognition towards Mongolian meat production. Minister of Food, Agriculture and Light Industry P.Sergelen said "By our requests in 2010, 2012, 2014 and 2016, experts' teams from the Eurasian Economic Commission have worked in Mongolia several times. But the current visit is unique for presenting the requirements on meat products to export". The meeting held discussion on increasing export and import of meat products, removing trade barriers and opportunities for mutual acceptance of laboratory test results. Also, the Ministry of Food, Agriculture and Light Industry of Mongolia requested for support in promoting Mongolian products in Eurasian countries, such as Russia, Armenia, Belarus and Kyrgyzstan. Ulaanbaatar, March 29 (MONTSAME) "Mongolia has big potentials to export meat and meat products which are pretty sufficient in the domestic market; unfortunately, the local production quality doesn't meet international standards", said A.Amarjargal, a specialist at the Ministry of Food, Agriculture and Light Industry at a meeting on March 28, Tuesday. Themed 'Cooperation on standard technical coordination, veterinary and health', the meeting took place between Mongolia and the Eurasian Economic Union. Following the request of Mongolian Government, Mongolia's cooperation with the Eurasian Economic Union on meat export to its members has been on agenda since 2010. From Mongolian side, international relations officers, businesspeople and specialists from Mongolian Agencies for Standardization and Metrology and Specialized Inspections partook in the meeting to discuss ways to increase export of animal products, settle challenges in foreign trade, and mutual acceptance of laboratory test results whereas the Eurasian Economic Union was represented by 7 delegates. Also, a two-day seminar is being organized to acquaint Mongolian business representatives with Eurasian standards and prerequisites. Full version of this story is available on 'English News' daily bulletin published by MONTSAME. Ulaanbaatar, March 29 (MONTSAME) A political consultative meeting between Ministries of Foreign Affairs of Mongolia and the Russian Federation took place successfully in Ulaanbaatar on March 28. The consultative meeting was co-chaired by Sh.Odonbaatar, Director of Policy Planning Department of the Mongolian Ministry of Foreign Affairs and O.V.Stepanov, Director of Foreign Policy Planning Department of the Russian Ministry of Foreign Affairs. D.Davaasuren, State Secretary of the Mongolian Foreign Ministry received the Russian delegation and exchanged views on bilateral ties, regional cooperation and and other issues concerning international affairs. After talking about relations between Mongolia and Russia, the sides highlighted that the bilateral political relations are being developed at a high level and underlined the importance of moving bilateral cooperation in the fields of trade and economy forward. Afterwards, they mentioned that high level meetings and reciprocal visits are significant to the partnership of Mongolia and Russia relations and cooperation and noted that the two sides need to gear up for prime ministerial visits. March 29 (gogo.mn) Mark Garnier, Parliamentary Under Secretary of State at the Department for International Trade to pay an official visit to Mongolia during Mar 31 to Apr 1, 2017. During his visit, he will ring the opening bell at Mongolian Stock Exchange and open the trading of March 31. Ulaanbaatar, March 29 (MONTSAME) Mongolian Minister of Justice and Home Affairs S.Byambatsogt is attending "Unity for Security Forum", which is being hosted by the United Arab Emirates and International Criminal Police Organization or INTERPOL in Abu Dhabi, United Arab Emirates on March 28-30. The three-day international forum, which is being attended by Ministers of Home Affairs of over 50 countries, is aimed at focusing the thoughts and efforts of ministers, police chiefs and the private sectors on their roles and responsibilities to improve global security. During the forum, Minister S.Byambatsogt met with Deputy Prime Minister and Minister of Interior Saif bin Zayed Al Nahyan on March 28. The Ministers discussed ways to develop cooperation of the Ministries of Home Affairs of the two countries, for instance, by sharing experiences of law enforcement activities and training police officers. March 28 (President of Maldives) The Non-resident Ambassador of Mongolia, His Excellency Gonching Ganbold presented his Letter of Credence to the President Abdulla Yameen Abdul Gayoom, this morning, at the President's Office. At the ceremony, the President congratulated Ambassador Ganbold on the commencement of his term and welcomed the Non-resident Ambassador to the Maldives. During the call, the President highlighted on the 32 years of close relations between the two countries and expressed confidence that the relations would strengthen in the years to come with frequent exchanges between high-level officials of both countries. The President also noted that the Maldives and Mongolia share common views at the International fora and gave the assurances to enhance the relations between the two countries. The Ambassador conveyed greetings and good wishes from the President of Mongolia, and expressed gratitude for receiving him as the Non-resident Ambassador of Mongolia to the Maldives. The Ambassador also placed importance in fostering friendly relations, and discussed on exploring avenues for further cooperation between the two countries. The President was accompanied at the call by the Minister of Foreign Affairs, H.E Dr. Mohamed Asim, and the Minister of State for Foreign Relations, H.E Mr. Mohamed Naseer. - Ulaanbaatar, March 30 (MONTSAME) The Cabinet approved a guidance for Mongolian delegates to attend Second meeting of the joint intergovernmental commission on economic and technical cooperation between Mongolia and Italy, will take place on April 5-6. At the meeting, the sides will discuss the current situation of bilateral relations of the two counties and define directions of further cooperation. Moreover, the sides will seek more possibilities to broaden bilateral ties in the fields of construction and urban development, roads and transport, education, culture and science, environment and tourism, agriculture and light industry. The Mongolian side is planning to make proposals to the Italian side on introducing high technology from Italy to the industrial sector. March 30 (Juneau Empire) After the fall of the Soviet Union in the early 1990s, Mongolia has increasingly embraced the Western political ideology. Positioned between post-communist and communist superpowers in Russia and China, the sparsely-populated nation depends on agriculture and coal but has a surprisingly cosmopolitan capital in Ulaanbaatar. As the country strives to expand their economy, they're reaching out to America to learn how democracy can sustain free markets. For five newly-elected parliamentarians from the country's State Great Khural, that journey started with a U.S. Congress-sponsored trip to Juneau early this week. "Mongolia, after living through a communist regime, it was the first country that was part of the satellite of the Soviet Union, first Central Asian country that embraced democracy in a true sense and the first Central Asian country that went into an accepted parliamentary form of democracy," Tsogtbaatar Damdin said in a Monday talk for the Juneau World Affairs Council. Juneau World Affairs Council sponsors lectures from leading figures in global affairs. "We were the first to embrace this Western ideology of freedom," Damdin said. From there, democracy spread to other Eurasian countries. "This is a country that was heralding the new ideology, new ideas and that was influencing other countries. … Mongolia may be small, but it can influence historical processes," Damdin said. The delegation was in town early this week on a diplomatic exchange through the U.S. State Department. The idea behind visits like these is to cross-pollinate ideas between U.S. democratic institutions and foster America's brand of democracy in Eurasia. During their trip, the five parliamentarians visited the University of Alaska Southeast, the Alaska State Capitol and the Mendenhall Glacier, accompanied by translator Chimgee Erdenechimeg and a representative from the U.S. embassy in Ulaanbaatar. The trip alternated between serious intellectual exchange and lighthearted sightseeing. On Monday, they sat down with mayor Ken Koelsch in the Assembly chambers to learn about city government. Sharing the language of bureaucracy, things got a little wonkish at the Assembly chambers. Damdin looked comfortable in the seat usually reserved for Assembly member Jesse Kiehl. He asked about the city's tax structure. "Property tax is an important part of your revenue. How did the subprime mortgage crisis affect property prices here?" Damdin said. "Juneau has always had a housing shortage and still does," Koelsch answered. "So it was not that dramatic in scope. The last time we had a recession and threat of a capital move and oil revenue wasn't very good, it affected property a lot here. This past year has been very stable." Mongolia has what's called a unicameral parliamentary legislature. Instead of a house and a senate, the country uses a single 76-member parliament — officially known as the State Great Khural. The insistence on bicameral structures at all levels of government struck a contrast for Damdin. "I understand (bicameral structure) at the top level, where you really try to prevent the possibility of a dictator," Damdin said after meeting with the mayor. "But you have it at every level down to the local level. It seems to me it could get very expensive, but that is your system and I am not here to comment on that." Damdin was impressed by the simplicity and accessibility of Alaska government. The government "hears ordinary people," and is "simple, not too complicated" that people can't come in and understand it, he said. Damdin has traveled on trips as a student — he studied at the Australia National University of Canberra and holds a Masters of International Law — but he said Juneau's hospitality was world-class. The group stayed with several families around town to get a closer look at life in Alaska. On Tuesday, Koelsch handed over ceremonial keys to the city to five parliamentarians. The group didn't miss a chance to pull Koelsch's leg. "In Mongolian tradition, if you give the key to the city, you have to have some door to open it. You also need to give that door," Erdenechimeg deadpanned. "We are pragmatic people." After a pause, the room lit up with laughter. March 30 (Homer Tribune) Follow the line of latitude that runs through Homer to the east some 4,000 miles and you will find yourself just above the northern regions of Mongolia. But while Homer and Mongolia may share some latitudinal characteristics, the mountainous, landlocked nation bordered by China and Russia is widely different than the coastal Kachemak Bay. What the two regions share, a recent meeting found, was a desire to strive for prosperity and new economic development opportunities. Last week, five members of the Mongolian Parliament visited Homer, observing the community's vibrant recreation and hospitality industries and learning about the region's agricultural efforts as well. The group came to Homer through the Open World Leadership Club, an organization aiming to introduce rising leaders of emerging democracies to legislative functions essential to democracy, a release from the Homer Kachemak Bay Rotary Club, which hosted the organization, said. Delegates met with local government, business leaders and community organizations and attended a roundtable discussion focusing on some of the economic engines in the Kachemak Bay region, such as tourism and agriculture. Nvaan-Yunden Oyundari, one of the delegates, said while many regions of Mongolia try to encourage tourism, some regions struggle with infrastructure issues, and prices are expensive for Mongolians to visit other areas of their country. But some inroads are occurring, as Asian tourists, mainly from Japan, are exploring the country, she said. Guidebooks are being written that explain how to travel in the large, spread-out nation. "This is information that we don't know — very practical information," said Oyundari. The delegation heard from the Bed and Breakfast Association about the collaborative way local bed and breakfasts work together to meet the needs of a large part of the visitors to Homer, as well as a variety of representatives from the agricultural sectors, who described Homer's extraordinary involvement in the nationwide high tunnel program, which has boosted local commercial agricultural production significantly. Many of the delegates were interested in hearing about this low-cost infrastructure that improves agricultural production in less-than-ideal growing conditions, saying it could be applicable in many regions of Mongolia as well. Oyundari said in urban areas, many farmers use organic practices and only the large-scale agriculture farms use pesticides and herbicides. Consumers are aware of the difference, she said, and many choose the organically-grown vegetables intentionally, she said. Also presenting at the meeting were representatives from Homer's Farmer's Market, Food Hub and the local Natural Resources and Conservation Services department, who all spoke to the ways they help facilitate a wide variety of farm-related resources for area farmers and ranchers. Homer's peony-growing farmers also presented on that industry, describing the process of setting up a peony farm in Alaska and the advantages of growing in a northern climate such as Homer. While in Homer, the delegates also visited with a wide variety of community leaders, from newspaper producers, who discussed the role of free press and open community newspapers in a democracy, to representatives from local environmental and nonprofit organizations. While in Homer, the delegates Batsukh Saranchimeg, Dakiyei Murat, Oyundari, Damdin Tsogtbaatar, and Namsrai Tserenbat, all members of the parliament (State Great Khural) of Mongolia as well as Gulgoo Zolboo, a political assistant in the U.S. Embassy in Ulaanbaatar, who accompanied them as a facilitator, stayed with local residents as a way to further experience the ways of life in Kachemak Bay. Open World has introduced more than 26,000 current and future decision-makers from Eurasia and other countries to American political and civic life, and to their American counterparts. Open World delegates range from first-time mayors to veteran journalists, from nonprofit directors to small-business advocates, and from political activists to judges at all levels. The landlocked Asian country suffered decades of tumult and uncertainty in the early decades of the 20th century before attaining total independence from China. Both Tsarist Russia and the Soviet Union were major factors in Mongolia becoming a free country. March 30 (Russian Beyond the Headlines) The landlocked country of Mongolia, which gave the world Genghis Khan and had the largest contiguous empire in history, was reduced to a subject of China's Qing Dynasty by the 17th century. Being a nomadic Buddhist country, by the early 20th century, almost a third of the male population of Mongolia consisted of monks. "While the vast majority were disconnected from Peking, the winds of change blew on the country at the same time as the collapse of the Qing Dynasty," Lubsan Kiribizhekov, a China and Mongolia scholar from Russia's internal republic of Buryatia, told RBTH. "Russia's Romanovs, who had an antagonistic relationship with the Qing Dynasty, and had a long border with Mongolia, stirred the pot and encouraged revolutionaries." Kiribizhekov, who is based in Hong Kong, added that Mongolia was involved in a power play between Russia and China in the early 20th century. "Tsar Nicholas II wanted Mongolia to initially be an independent state under Russian influence." In 1911, when plans were unveiled by the Qing Dynasty to resettle ethnic Han Chinese in Mongolia, there was a great degree of resistance from the people in the territory. "The very idea of resettling Chinese in Mongolia was supposedly to stop a Russian takeover of the region," Kiribizhekov added. Bogd Khan, a religious leader with Tibetan roots, who led the Mongolian independence movement, sent a delegation to St. Petersburg requesting both military and diplomatic assistance for his cause. While Russia refused to provide military assistance, it agreed to use diplomatic channels to help the movement. "Sando, the Chinese Viceroy in Mongolia, was asked by the Qing Dynasty to negotiate with Bogd Khan and make him withdraw the request for Russian assistance but he lacked the diplomatic skills and behaved in an arrogant manner," Kiribizhekov said. "The Khan took advantage of the volatile situation in Peking, where the Qing Dynasty was on the verge of collapse, and organized a bloodless revolution and declared independence from China." A Mongolian delegation, backed by armed Russian Cossacks under the command of Grigory Semyonov, demanded that Sando leave Mongolia and that Peking recognise the independence of the country. Sando had to agree and was escorted to the Russian consulate for protection and safe passage back to China. Peking however refused to recognize Mongolian independence, although it virtually had no control over the country. Although it did not officially recognize Mongolian independence, Russia welcomed a buffer state that could halt Japanese expansion in Northern Asia. Just six years earlier, Russia had suffered a humiliating defeat to Japan in a war that cost Moscow half of Sakhalin Island. Emboldened by the independence of what is called "Outer Mongolia" by the Chinese, Bogd Khan looked to establish a greater Mongolia that would include Inner Mongolia (which was in China) and other lands traditionally inhabited by Mongolian people. "This is when Nicholas II sensed the real danger," Kiribizhekov said. "The Tsar feared a large Mongolian state that would comprise of modern day Mongolia and Inner Mongolia, and claim parts of Russia. In such a case, Russia would have had a serious rival instead of a buffer state with China and Japan." Bogd Khan ruled Mongolia from 1911 to 1919 and again from 1921 to 1924. The country made numerous attempts to annex Inner Mongolia. While Russia maintained that Mongolia was an autonomous region of China, it agreed to train the Mongolian Army in return for commercial privileges. "In this geopolitical game, parts of the modern-day internal Russian republic of Tuva became a Russian protectorate, and a 1915 tripartite agreement between Russia, China and Mongolia, recognized the country as an autonomous part of China," Kiribizhekov said. With Russia engrossed in the First World War, China managed to sway Bogd Khan to fully recognize Peking's sovereignty over the country. "For a few years, Russia was not a player in Mongolia, and China managed to have control over large parts of the country," Kiribizhekov said. The ensuing Bolshevik Revolution and the Russian Civil War meant that Moscow's attention was diverted away from Mongolia. During the Civil War, Cossack leader Grigory Semyonov mobilized Cossack troops, Buryats and ethnic Mongols to help form a greater Mongolia, but did not enjoy Bogd Khan's support. Friction between Buryats and Inner Mongolians led to the failure of Semyonov's plans and China managed to completely seize control of Mongolia. "Semyonov was a visionary, who could have changed the course of Mongolian history, but his plans could never materialize," Kiribizhekov said. By 1919, Mongolian autonomy was abolished. Once China reoccupied Mongolia, it again commenced its program to resettle Han Chinese in the country. The resistance movement was strong in the country, and about to get assistance once again from the White Russians, who were loyal to the late-Tsar Nicholas II. In October 1920, White Russian troops invaded Mongolia and managed to get the backing of Bogd Khan. In early February 1921, a force comprising of Mongolian volunteers, Buryat and Russian Cossacks defeated the Chinese and forced them out of Urga, now Ulaan Bataar. Some Chinese troops managed to reach the northern borders of Mongolia, while most fled south to Inner Mongolia. A month later, the Soviet Red Army and troops loyal to Mongolian revolutionary Sukhbataar attacked Mongolia, defeating both White Russians and the Chinese troops. "This invasion was known as the 'Mongolian Revolution of 1921' and essentially created the modern Mongolia," Kiribizhekov said. "There have been stories of Sukhbataar and Vladimir Lenin meeting in Moscow, but these are probably untrue. Mongolian communists even presented a statue of the two leaders in conversation to the Soviet Union." Mongolia adopted the Cyrillic script and remained a Soviet satellite state till 1990 when another revolution established democracy. Ulaanbaatar, March 30 (MONTSAME) The Asia Foundation and Ministry of Education, Culture, Science and Sports (MECSS) conducted a survey on "Transparency, ethics and corruption issues in Education sector" and on March 27, they presented the results of the survey to officers of the Ministry. The survey concluded that ethical offences and minor corruption is widespread in educational service and common cash transfer through teachers and students negatively influence to their ethics and behavior. The survey also revealed that collection of donations, fees and payments, transparency and control on them and reporting were insufficient. The survey was supported by the Government of Canada. Chairman of MECSS Education Policy Department D.Erdenechimeg noted that the ministry plans to take certain measures following the survey result. Ulaanbaatar, March 31 /MONTSAME/ History of Mongolia textbook has been edited for the use of Bachelor's students by a team of Department of History at the National University of Mongolia, the biggest center for historical studies and research in the country. With aims to distribute wide knowledge meeting with international standards and create citizens with individual, critical and creative thinking, historians led by academician J.Boldbaatar, Dr. P.Delgerjargal and D.Ulziibayar have thus revised the account of Mongolian history. The authors claim that the new edition is distinctive for several reasons such as its unconventional style of writing supplemented with simple use of terms, synchronization of the main text with maps, images, tables, diagrams and indexes and approach to historical events that took place in Mongolia with connection to world history. The book will be launched on April 5 at the first building of the National University of Mongolia. March 30 (news.mn) Mongolia's enigmatic history is honored at the International Intellectual Puzzle Museum, or the IQ Museum for short. The museum is the creation of Tumen Ulzii, who was born to nomadic herders and would have followed that path had he not fallen in love with logic puzzles at an early age. His father gave him a six-piece burr puzzle with one piece missing. After he solved the problem of the missing piece he began creating his own puzzles, eventually founding a company to manufacture logic games for the youth of Mongolia and a museum to showcase puzzle and logic history. Ulzii's work has not gone unrecognized—he has been awarded the prizes for "Best Inventor in Mongolia" and "Meritorious Person of Culture." The museum displays some puzzles created by Ulzii himself, as well as rare and precious puzzles from around the world. Over 5,000 toys, puzzles, and games are on view, most of which visitors are invited to fiddle with. Ulzii's inventions are usually wooden, the pieces carved into whimsical Disney characters and animals of the zodiac. Some even depict figures from Mongolian history, like Genghis Khan. The simplest are the traditional six-piece models, but some puzzles in the museum include as many as 350 pieces. There are also various puzzles made from gold, precious stones, and silver. One turtle-shaped puzzle offers a prize of $100,000 if solved within a specific timeframe. In the museum's three decades of operation, no one has ever solved it. Mongolian chess, another of Ulzii's passions, is also featured in the IQ Museum's exhibits. Masterful woodcarving, a skill essential to crafting the intricate puzzles, is also exhibited at the museum in the traditional furniture which decorates the space. The purpose of the museum is not just to catalogue the history of puzzles in Mongolia, but to remind visitors that curiosity and play are an important part of training the brain. Visitors to the museum are guided by a docent who performs magic tricks, watches you struggle with the puzzles, and reveals their solutions to you in a matter of seconds. Date: Monday, 27 March 2017, at 4:15 a.m.
Ulaanbaatar Elite International was established in 2005. At present, we are one of the prestigious and recognized international school in Ulaanbaatar, Mongolia. Our school is following the Cambridge International Curriculum. We offer Cambridge Primary, Cambridge Secondary, and Cambridge IGCSE. Our school population is made up of students and teachers from different countries. Date: Thursday, 30 March 2017, at 11:45 a.m.
UIIE has been contracted to provide English for academic purposes within an academic institution in Ulaanbaatar and so requires a suitably qualified coordinator and experienced teachers. In addition to presenting the course, successful candidates will be expected to manage curriculum materials, assessments and reports for students and management. Candidates for the coordinator position should be a native speaker and have a minimum of 2 years' experience coordinating EAP within a university / higher education environment. Applicants will also need a graduate degree and TESOL / TEFL / CELTA qualifications to be considered. Preference will be given to experienced candidates with a master's degree or who have professional qualifications such as DELTA. The teaching position requires individuals to have at least 3 years' experience to be considered. The coordinator position pays a higher tax free salary of 4,500,000 MNT monthly (Approx $1800). The teaching roles pay a tax free salary of 2,500,000 MNT monthly (Approx $1,000). UIIE will also provide single accommodation, health insurance, flights to and end of contract flight from Mongolia and a work permit. Ulaanbaatar, March 29 (MONTSAME) A Mongolian woman named N.Solongo has won the local election of the president of the Youth Union in a constituency of Bavaria, Germany, having nominated by one of the most prestigious political parties in the state. It was three years ago when N.Solongo stepped foot in German politics by becoming a citizen's representative deputy of Bavaria and entered the Christian Social Union party. She is the first Mongolian national to hold a high-ranking political position in Germany. N.Solongo worked as an assistant to member of Bundestag and the Economic Standing committee of the Federal Cabinet in 2015. In an interview, she said "Of course, I was overwhelmed at the time when I was first entering the politics of such a great power, because I'm not a politician. The one advantage I possessed was that I was good at communicating with others. I have a way of getting along with any type of people. This characteristic has been my strength all along, as well as my honesty and openness". A third workshop within the framework of the UNESCO/Monaco cooperation for the stabilization of the archaeological tomb of Shoroon Bumbagar and preservation and conservation of its ancient mural paintings will be held in Bayannuur, Mongolia from 3-15 April 2017. The forthcoming workshop is a continuation of previous trainings that have addressed the theoretical and practical geological aspects of stabilizing the tomb of a 6th to 7th century AD nobleman and conserving and restoring its mural paintings. Following last years' practical exercise to test the material components of the tomb in order to utilize suitable adhesives of plasters and apply the right chemical compounds to address the issue of destructive microorganisms on the mural paintings, this round of exercises will develop on this base of knowledge and skills of the selected national conservators to restore and conserve the site from start to finish. With the guidance of an international expert in painting conservation/restoration, this years' workshop aims to demonstrate the progression of conservation work on a sample area of paint layer in the tomb, from the initial phase of testing and analysis into restoration and conservation, up until the final phase, the aesthetic presentation of the painting, with the hope that Mongolia's national conservators will be able to repeat the process on similar future situations in the country. This is in line with the main objectives of the project by the Principality of Monaco and UNESCO to improve the capacities of Mongolia's authorities and experts for the stabilization, conservation and preservation of the Shoroon Bumbagar necropolis and sensitize local authorities and communities in Mongolia on the importance of the protection of archaeological cultural heritage. The second aim of this workshop will be to address various issues found in the micro-climate of the tomb that are causing the proliferation of microorganisms and the degradation of the mural paintings. An environmental expert will be on site during the workshop to inform the group of conservators on ways to assess the environmental/climate parameters causing deterioration processes in the tomb and suggest adequate responses. This workshop is jointly organized by UNESCO, the Ministry of Education, Culture Science and Sports of Mongolia, the Mongolian National Commission for UNESCO and the Center of Cultural Heritage of Mongolia. March 29 (The Earth Chronicles of Life) Archaeologists for 4 months kept their discovery in secret, for fear of vandals. November 27 last year in the rocks on the territory of the altan Altanktsgts Bayan-lyghy aimak Mongolian archaeologists discovered a burial supposedly related to the XIII – XVII centuries. The body was in a carved wooden coffin. Next to the body were a saddle, a stirrup, a stroller, a bow and arrow, a saadag quiver, a wooden bowl, a Mongolian deel from cloth and an escigo ongo-felt ongon. Ongo or ongon is the spirit of the ancestor of the family or clan, its iconic image in the culture of the Mongolian peoples. Employees of the Institute of Archeology and History of the Mongolian Academy of Sciences investigated the findings and found that their initial assumption about the age of the find turned out to be incorrect. The discovered burial belongs to the XII century. All the finds-the saddle, the stirrup, the carriage, the bow and arrow, the saadag quiver, the wooden bowl, the Mongolian deel from the cloth and the esggi ongo-are very well preserved. For the first time, a cult image was discovered – Ongo of the ancient Mongols, made of felt. Parts of the ongons (wolf fangs, deer antlers, bones, feathers of birds, parts of wood, etc.) were used as amulets. Ongon also called the image, the iconographic sign of the spirit, the deity. Ongons are considered the receptacles of the spirits of the dead ancestors. They are made of wood, wool, fur, leather, felt, metal and fabric. Springtime in the Gobi Desert. A family of nomads assist in the births of its camel herd. They face a crisis when one white calf is rejected by its mother after a particularly difficult birth. When all hope seems lost, the family sends its two young boys on a journey to a far-off village to fetch a musician capable of performing a magical ceremony. The Story of the Weeping Camel is a work that combines hard-hitting truth with uplifting drama. The film's sweeping vistas and magical photography capture the very essence of this part of the world, while its emotionally charged story of separation and reconciliation reminds us that the heart, whether human or animal, knows no borders. In a review written in 2004, film critic Roger Ebert had this to say about the film: "Legend has it that if a camel finally agrees to nurse her young, this will cause her to weep. There are also a few damp eyes among members of the family. All of this is told in a narrative that is not a cute true-life animal tale, but an observant and respectful record of the daily rhythms and patterns of these lives. We sense the dynamics among the generations, how age is valued and youth is cherished, how the lives of these people make sense to them in a way that ours never will, because they know why they do what they do, and what will come of it. The causes and effects of their survival are visible, and they are responsible." Ulaanbaatar, 28 March 2017 (UNICEF) – Over 260 000 people are affected by harsh winter condition known as Dzud disaster in Mongolia. Last month the National Emergency Commission reported severe winter conditions in 158 districts (soums) of 17 provinces (aimags) and one district of Ulaanbaatar city. The Government-led assessment and the several multi-sector needs assessment reports highlighted that affected populations in north-eastern and north-western parts have been impacted by the cold spell in different ways: isolation, difficulty in accessing food and health services, and starvation for their livestock (the source of income). In response to the Dzud disaster, UNICEF handed over nutrition packages to Ministry of Health for children 6-59 months old and multiple micronutrient supplements for pregnant and lactating women in affected areas. UNICEF, Ministry of Health and the National Centre for Public Health are working in partnership to ensure that 26,116 boys and girls under 5 and 15,800 pregnant and lactating mothers in 158 soums in 17 provinces affected by Dzud have access to Multiple Micronutrient Powder (MNPs), nutrition screening for the identification of cases of acute malnutrition for referral for lifesaving treatment; and nutrition counselling, with a focus on infant and child feeding and care practices to the parents of children under two years old and pregnant and lactating women. These interventions, amounting to US$ 339,000 (funded by the Canadian Government) addresses both immediate life-saving and other mid-term needs of the affected children and women. Ministry of Health will complete the first batch of supply distribution by 12 April and the second batch sometime in May. "In any emergency, women and children are the most vulnerable. Children are especially vulnerable to disease and malnutrition. That's is why one of UNICEF's foremost priorities in emergencies is to prevent death and malnutrition amongst affected vulnerable groups: infants, children, pregnant women and breastfeeding mothers" says Roberto Benes, UNICEF Mongolia Representative. "That is why micronutrient supplements are so important in reducing maternal and child morbidity and mortality in dzud affected areas". March 29 (The Independent) Measuring eight metres long and probably weighing about a tonne, irritator roamed what is now Latin America, approximately 110 million years ago. Irritator's long snout indicates it most likely lived off fish, as did its cousins in the spinosauridae family, a group of predatory dinosaurs that included some of the largest carnivores ever to have walked the earth. Classified as irritator challengeri in 1996, "Challengeri" was a nod to Professor Challenger's character in Arthur Conan-Doyle's novel, The Lost World. "Irritator" refers to a darker side of this specimen's history. The palaeontologists who conducted the initial work on the only known fossil of this dinosaur found the skull had been significantly tampered with by commercial fossil hunters. The task of restoring the skull caused the scientists so much irritation that they named the dinosaur in recognition of this painstaking work. It's a struggle met by palaeontologists the world over, as illegal digs and unscrupulous commercial fossil hunters undermine crucial scientific research. Despite having dominated every continent for 150 million years, only 1,000 species of dinosaur have so far been identified, and many of these have been based on partial fragments. More than 170 years after the first dinosaur was classified by Richard Owen, scientists are still making discoveries that can dramatically alter our entire perspective on these extinct creatures. Only recently did Matthew G Baron and a computer programme, called TNT, use data from the world's fossil collections to completely reimagine the dinosaur family tree, potentially undoing almost 200 years of scientific dogma in the space of five minutes. Mongolia's Gobi Desert is one of the richest deposits of dinosaur remains on the planet and has turned out an array of fascinating new finds, including the world's largest dinosaur footprint. Yet this unique area is under threat as untrained locals take to the international black market in fossils, hacking at the ground with pick axes, often destroying valuable and irreplaceable remains. It's a surprisingly widespread practice, that has world-leading palaeontologists such as the University of Alberta's Philip J Currie very concerned. "It is very sad to see skeletons that in some cases are destroyed by pick axes just so the poachers can retrieve the teeth, claws or whatever else they feel will fetch them the best dollar for the smallest amount of effort," he says. "We have even found specimens that were worth collecting but did not have time to do it, so we covered them up and disguised the sites. When we returned the following years, the specimens had been dug up." It may not be as destructive as the ancient Chinese practice of grinding down fossils for use as medicines "from the dragon" but extraction and subsequent manipulation by untrained commercial fossil hunters can do serious harm to incredibly rare fossils. In the case of irritator, not only was the snout artificially elongated by commercial fossil dealers, the illegal exchange of the specimen meant the exact location of its discovery has never been identified. Another instance occurred when a Polish-Mongolian expedition working in Mongolia's Nemegt Formation in the mid-Sixties uncovered two gigantic 2.4-metre long arms, the largest associated with any bipedal dinosaur. What these striking limbs were attached to remained a mystery for almost 50 years. "The rest of the skeleton had been eroded away so we really did not know what the rest of the animal looked like and it was one of those animals that we were always looking for," says Currie. "In 2009, we found a poached specimen where the poachers had collected the skull, hands and feet of what we realised was deinocheirus. We now knew what this dinosaur was related to at least." This particular example has a happy ending, as the exact fossils that had been stolen were later found in Europe. Even well preserved fossils that enter the black market may have already lost considerable value to the scientific community. In a study known as "taphonomy", palaeontologists analyse what happened to a living organism between the point of death and its burial and fossilisation. The information can tell scientists a lot about the environment that the dinosaur or other prehistoric organism lived in. In addition to being assistant professor in the Department of Geoscience at the University of Calgary, Darla Zelenitsky helps the US Department for Homeland Security track and recover smuggled fossils around the world. "One of the biggest issues with fossil poaching is that the site where the fossil was originally found is usually unknown and thus information related to the age of the fossil, the environment in which the animal lived, and the other organisms that lived in the ecosystem at the time are all lost," Zelenitsky tells me. "The loss of this context can render fossils useless to science as such information is vital to a comprehensive study of the fossil organism and its ecosystem." That is, if scientists and national agencies are able to retrieve the fossils at all. Most of the black market fossils end up in private collections, without being studied by professionals, or viewed by the general public. Twenty twelve saw one of the most high-profile cases concerning a stolen dinosaur specimen, when a near-complete tarbosaurus skeleton appeared in a Manhattan auction catalogue. A large member of the tyrannosauridae family, tarbosaurus could be up to 10 metres long and weigh about five tonnes, slightly smaller than its more famous cousin, tyrannosaurus rex. Like the T-rex, they lived towards the end of the dinosaur's time on earth, in the late cretaceous, roughly 70 million years ago. The $1m (£796,400) sale of the specimen peaked the interest of Mongolia's then minister of culture, sport and tourism, Oyungerel Tsedevdamba, as well as several sceptical palaeontologists. Tarbosaurus, meaning "alarming lizard", has only ever been found in the Nemegt Basin. Under Mongolian law it is illegal to remove fossils from the country, leaving the culture minister and her colleagues to speculate as to how it had found its way to an auction in New York. In United States vs One tyrannosaurus bataar skeleton, Mongolia's President Tsakhiagiin Elbegdorj successfully sued for the return of the skeleton. The fossil was ceased and the dealer arrested, eventually serving three months of jail time for the smuggling of this specimen as well as two oviraptors and a Chinese flying dinosaur. Described by the US Department for Homeland Security as "clearly one of the most exceptional, if not the most exceptional" examples of cultural property repatriated to a foreign government, the tarbosaurus was flown back to Mongolia, where it has become the central attraction of its new natural history museum. At the time of his arrest, Eric Prokopi was described as a "one-man black market", but unfortunately for palaeontology, he was only a small part of it. In a bizarre twist, the actor Nicholas Cage was later caught up in Mongolia's efforts to bring home their prehistoric heritage, having unknowingly purchased a stolen tarbosaurus skull for $276,000 in 2007. Cage voluntarily handed over the skull, which had been sold to him by a gallery in Beverly Hills purporting its authenticity. The relatively recent burst in poaching activity is believed to have started with the sale of the world's most complete tyrannosaurus rex skeleton, known as Sue. Sold to Chicago's Field Museum for $8m in 1997, the landmark auction showed there was money to be made in excavating dinosaurs. Although it is hard to measure, the black market for fossils is understood to have grown since the 90s, with specimens typically originating from Mongolia and China. "International law is a little inconsistent when it comes to fossil poaching," warns Currie. "Technically it may be illegal to import poached fossils into many countries, but once they are inside those countries then they are treated as if they are legal and can be bought and sold without interference." The system relies on the country of origin and the country where the fossils have been smuggled to having an import/export agreement. The United States has repatriated several Mongolian specimens since the 2012 tarbosaurus incident. Zelenitsky is optimistic about the role of better education and enforcement of existing laws in the future. "Media attention has certainly brought the issue to the forefront, in particular the case of the tarbosaurus skeleton that was seized in the USA a few years ago and subsequently repatriated to Mongolia," she says. "Illegal fossils bought by Hollywood stars have also educated the public on the potential issues of buying such fossils. "Areas of most concern have been places like Mongolia, Argentina, and China, all of which have relatively strict laws with respect to the export of vertebrate fossils. At least in Mongolia, for example, there seems to have been a reduction in the amount of fossil poaching in recent years, perhaps in part due to the enforcement of laws in markets like the USA." While public awareness might be improving at the "demand" end, at the supply end officials in Mongolia face considerable difficulties in getting their message across to local people who might become involved in the trade. "Education is a good start," Currie advises. "Although the original Mongolian laws were from 1925, I think most people in the country had forgotten about them. And additional laws to protect fossils had been passed but not enforced. "The big problem is that Mongolia is a big country with an enormous border." Part of the task to enforce has fallen to Surenjav Munkhsaikhan, a herder and park ranger who is looking after an area of rich fossil deposits. Speaking to Ben Dooley, Munkhsaikhan told Phys.org that she's the sole guardian of a 24,700-acre area of desert where fossil poaching has been taking place in recent years. She does so on the back of an old motorbike, but "really wants some drones" for better surveillance. Mongolia's other mineral wealth, its reserves of coal, copper and gold have delivered strong economic growth for the country over the last seven years. But a fall in commodity prices has taken its toll on what is still a very poor country, and it received a $5.5bn IMF-backed loan last month. A sharp commodities slump, coupled with a fall in foreign direct investment and a widening deficit means cash-strapped Mongolia may find it difficult to police its vast desert and the irreplaceable natural wonders that lie underneath it. Perhaps surprisingly, given international interest in natural history and the money that can be made from selling and exhibiting prehistoric remains, very little in the way of financial or practical help has been offered to Mongolia. "There doesn't seem to be as much financial sympathy for animals that are already extinct," Currie says. Institutions and individuals express their concern, but the funds have not been forthcoming. Baron's new research underlines how much there is yet to learn about these animals, with the data now suggesting dinosaurs could have emerged slightly earlier than thought, and that the first of their kind might have evolved in the Northern hemisphere, rather than South America, as previously thought. But with actors willing to spend as much as £185,000 on a single Mongolian tarbosaurus skull, and the next Jurassic World film set to bring in more than £1bn when it debuts next year, palaeontologists might be hoping some of the funds generated by these extinct creatures could be used to protect their future. Ulaanbaatar, March 30 (MONTSAME) Seven Mongolian athletes will be challenged at the King's Cup International Boxing tournament to be held in Bangkok, Thailand between April 2 and 10. The national team is coached by D.Batsuren, D.Bandi and N.Munkhsaikhan. The boxers are to compete in weight categories as follows: G.Gan-Erdene – 49 kg, M.Gandulam – 52 kg, O.Munkhsaikhan – 56 kg, Rio Olympics' bronze medalist D.Otgondalai – 60 kg, Military World Champion B.Chinzorig – 64 kg, Asian championships' bronze medalist B.Tuvshinbat – 69 kg, and J.Otgonjargal – 75 kg. Ulaanbaatar, March 30 (MONTSAME) The Twenty-Second Annual Sri Chinmoy Ten-Day Race starts on Monday, April 17 in New York, USA. This race is held concurrently with the Twentieth Annual Sri Chinmoy Six-Day Race which starts on Friday, April 21. Both races end on Thursday, April 27. The races were previously called The Self-Transcendence Six and Ten-Day Races. In this extreme race, an international field of runners come to test their endurance, skill with pacing, and ability to recover from the stress of constantly moving. From Mongolia, the best five athletes of ultramarathon, including A. Budjargal, Master of Athletics and Mountain Sports will take part in this competition. In this regard, he is one of the best athletes who has been running in marathon for more than 20 years. Ulaanbaatar, March 29 (MONTSAME) 2017 Junior National Wrestling Championships will take place on March 31-April 2 in Ulaanbaatar. This year's championships will be held under the auspices of "Arj Capital" LLC. The boys and girls who were born between January 1, 1997 to December 31, 1999 are eligible to participate in the tournament of Greco-Roman wrestling. The champions of the event will take part in the Asian Junior Wrestling Championships and the Junior World Wrestling Championships, which will be organized at the end of July. Ulaanbaatar, March 29 (MONTSAME) Budapest Spring Festival 2017, an international chess tournament and festival took place in Budapest, Hungary on March 18-26. In the group "B" /1800-2199 ELO/, Mongolian young chess player of "Monchess" club Kh.Itgelt triumphed over 140 players of more than 40 countries. Under the training of Ts. Batsaikhan, 11-year-old National Master of Mongolia won 126 rating points against players who are at least 30 years his senior in average. The Budapest Spring Festival is one of the biggest cultural events in Europe. The grand Chess Festival takes place in one of the most modern, imposing exhibition hall named Balna (The Whale). The tournament took place in 3 groups of different set of skills with a prize HUF 1 million for group A, HUF 100 thousand for group B and special prizes for group C.
Ulaanbaatar, March 29 (MONTSAME) Judo uniforms /judogi/ of Beijing 2008 Olympic Champion and Hero of Labor of Mongolia-titled N.Tuvshinbayar and Rio 2016 Olympics silver medalist D.Sumiya were sold through an open auction during a "Reputation–Strength" a judo competition held on March 16. The competition was organized under the name of State Merit Athlete of Mongolia D.Tserenkhand at the Mongolian National "Asa" Circus. 10 percent of the proceeds from the sales were donated to the Mongolian National Federation of Wheelchair Users and 70 percent of them was given to a family of D.Tserenkhand. The previous owners of the judogis, the Olympic medalists, were entitled to the 10 percent of the proceeds. At the auction, N.Tuvshinbayar's judo uniform was sold at MNT 8 million and a uniform of D.Sumiya was valued at MNT 3 million 600 thousand. Hunters Video DVD: "Hunting in Kazakhstan and Mongolia"
Ulaanbaatar, March 31 /MONTSAME/ State Honored Artist of Mongolia G.Ariunbaatar, soloist at the Mariinsky Theatre of Saint Petersburg, has taken part in the International Belt & Road Music Festival, held in Shenzhen, China. He was invited by the chairman of the Chinese Musicians' Association. Aside from singing the world classics, G.Ariunbaatar sang the "Mongoliin Tal Nutag" (Steppes of Mongolia) by the renowned composer and Chingis Khaan Order laureate B.Sharav. G.Ariunbaatar will be staging his concert on June 28 in cooperation with the Chinese Musicians Association at the National Centre for Performing Arts, also known as the "Giant Egg" Theatre of Beijing. He is also expected to go on a tour through seven major cities in China. March 30 (The Gauntlet) Mongolian Folk Metal Group TENGGER CAVALRY Signs with M-Theory Audio to Release New Full-Length Album in June. TENGGER CAVALRY - the nomadic Mongolian folk metal group whose exotic sound has been praised by outlets ranging from Metal Hammer and Terrorizer to Billboard and CNN - has signed with M-Theory Audio. The band's new album is expected to be released in June and will be supported by a five-week North American tour and performances at several European summer festivals. Further details will be revealed in the coming weeks. M-Theory Audio is the new label recently launched by Marco Barbieri, former president of Century Media Records and Nuclear Blast America. Barbieri says, "TENGGER CAVALRY is one of the most unique new bands, and I've been impressed how Nature Ganganbaigal and the group developed themselves to this point independently. By teaming up with an old friend, Dawn Robinson, as management and now working with us at M-Theory Audio, I'm excited by the upward possibilities the future holds and the fun and breakthroughs possible with their themes and great music." TENGGER CAVALRY frontman Nature Ganganbaigal adds, "To work with Marco, who was an integral part of Century Media, and M-Theory Audio is TENGGER CAVALRY's greatest honor. We are excited to bring on our next 'raid' together with the mighty M-Theory!" One of the most unique and innovative acts in modern music, TENGGER CAVALRY ("the army of the sky god" in Mongolian) blends the nomadic musical traditions, instrumentation and warrior spirit of Central Asia with the aggression and power of heavy metal. The group was founded by Nature Ganganbaigal, who sings using the ancient Mongolian tradition of Khoomei (more commonly known as throat-singing) and plays multiple native instruments, including the Morin Khuur (an ancient fiddle), the Tovshuur (a Mongolian guitar) and the Mongolian flute. Following Ganganbaigal's relocation to America four years ago, TENGGER CAVALRY has successfully completed two headlining tours and even sold out a performance at New York City's prestigious Carnegie Hall. Ulaanbaatar, March 31 /MONTSAME/ The annual tourism fair International Travel Mart (ITM) Mongolia, co-organized by the Ministry of Environment and Tourism and Mongolian Tourism Association opens today at Misheel Expo center for the 18th year. The expo has been considered an ideal platform for administrative units across Mongolia to promote new infrastructure development, tourism brand and tourism products in their localities. Aiming to promote Mongolia's tourism industry, and introduce major tourism projects and programs implemented in 21 aimags and the capital city to public, the exhibition will continue until April 2, Sunday. However it's notable that on March 31, today, the exhibition is unavailable to general public as a forum on cooperation in tourism and a Business-To-Business event will be held among tour operators and concerned parties. Inviting the public to the fair on April 1-2, the organizers will also host a Tourism Labor Market event on the last day which enables more than 300 job opportunities by over 40 employers. The organizers estimate that some 250 organizations including tour operators, businesses, hotels, tourist camps, guest houses, government and non-government organizations, cultural organizations and tourism product manufacturers will be participating in the expo. Ulaanbaatar, March 30 (MONTSAME) During its regular meeting on March 29, Wednesday, the Cabinet tasked corresponding Ministers and heads of agencies to form a pre-operation unit to be in charge of completing preparations for the operations of new airport in Khushig Valley, resize the vacancy limit of organizations affiliated to Mongolian Civil Aviation Authority in connection to the new airport, and resolve the required fund. The Civil Aviation Authority was assigned to conform the airport's safety to international standards and have it certified; was also authorized to use a land allotted for hotel for flight service purposes. Also, the Cabinet instructed corresponding Ministers and governors to formulate an adjustment for the general development scheme of a city to be established near the airport and a draft plan on establishment of the city, and introduce it to the Cabinet within the second season of this year. The Cabinet also assigned corresponding officials to report on the issue of operating the new airport as an airline hub within the second season, and construct a power station to supply additional electricity to the airport and expand the liquid fuel facility at Zamiin-Uud inland port with jet fuel pipelines within the third season of 2017. March 29 (Valley Journal) They weren't just "horsing around," they also got to experience a new culture. Columbia Falls residents Greg and Deb Schatz presented details of their trip to Mongolia on Friday at KwaTaq- Nuk Resort as part of the Montana Back Country Horsemen convention. Greg said Mongolia was the only foreign country the couple wanted to visit. That's because of their love of horses. "The horse packing in Montana came from Mongolia," he said, explaining that it came through the Spaniards who traveled up from Mexico. The Schatzs visited the Darhad Valley in the Mongolian state of Khuvsgol Aimig for three weeks last summer. It was the only the third time the couple had flown on an airplane since they married in 1988 and moved to the Flathead in 1989. They flew from Kalispell to Seattle on Alaska Airlines and then on Korean Air to Seoul and Ulaanbaater, the capital of Mongolia, which became a democracy in 1990. Greg feels like he has a connection with the herders in the Darhad Valley. The steppes there are similar to those not far away in Russia where his great-grandparents on both sides of his family came from, he said. The deep-fat fried doughnuts the Mongolian herders eat with just about every meal also remind him of what his ancestors ate, he said. The Schatzs were part of 30 people who took the trip to ride horses alongside the herders. The trip was sponsored by the non-profit Bioregions International of Bozeman. Others who went were six Native American students from Montana State University, a medical team of five and a soils team of four, among others. The Schatzs explained to the herders how they take different kinds of outfitter trips with members of the public into the Montana backcountry, including the "Leave No Trace" theme. The culture of the Mongolian herders is such that they have "zero materialistic values," Greg said. They live in little cabins, and while they are herding away from home they will sleep on the permafrost or in a 30-foot-diameter ger or yurt. Deb said her most memorable part of the trip was "how they respect the land and how everything is sacred." Typical herder religions range from shamanism to Buddhism to what Greg calls "naturalist." which includes a respect for "Mother Earth" and "Father Sky." The herders do not dig the soil or cut the grass out of respect for the earth, so no gardens are grown. Ovoos, which consist of piles of stones or tree branches, are built on hills or mountains. Horse skulls and other objects such as khadag, or blue scarves, which represent the Eternal Blue Sky, are hung from them. Such offerings are made when one comes across an ovoo and circles it three times clockwise. The herders will often tie or hobble their horses to their own legs or to another horse to prevent them from wandering off during stops if no post is nearby. The typical horse lives to age 20 and is then "put down" and eaten by the herders. This is a form of respect, Greg said. The herders raise horses, cows, Cashmere goats, sheep and yaks. The yaks are raised for their meat and milk, which is used to make cheese and yogurt, while sheep are raised for meat and fur. Reindeer live to the north of where the Schatzs visited, although they saw two on their trip. Cottonwood trees grow near the riverbanks in the land of Genghis Khan with Siberian larch in the foothills and spruce and fir in the mountains, which Greg described as similar to Montana. He noted that some 8.3 million acres have been set aside in Khuvsgol Aimig for state and national parks. The Schatzs plan to return to Mongolia in the summer of 2018. A Family Adventure With The Eagle Hunters Of Western Mongolia. (Whistling Arrow) The fabled eagle hunters of western Mongolia have captured the imagination of intrepid travellers for years. To this day, the close relationship between man and raptor seems to touch a deep desire in many of us for a closer connection with nature. Their nomadic home range, in the large glacial valleys and snowy peaks of the Altai mountains also remains one of the last untouched frontiers in Asia. And it is this spectacular wilderness that provides the backdrop for our newly-launched expeditions designed specifically for adventurous families.The trips are an amazing combination of moderate wilderness hiking, horse-riding (optional), comfortable ger-stays (or camping) and exploratory visits to ancient petroglyphs. Oh, and there's an immersive family-stay with the eagle hunters of course. The family excursions are tailored to suit you and your family and so vary in price depending on your exact schedule and the number of people in your group. The best months for the private trips are June through to September and the optimal length of stay is between 10 and 15 days in total. A one-month journey from Beijing to St Petersburg that's not quite the Trans-Siberian Railway. Follow Donovan as he traverses Mongolia, Kazakhstan and Kyrgyzstan. March 28 (TripZilla) Do the words "Trans-Siberian railway" conjure up images of dark mystery, overwhelming dread and bitter coldness? You can never be more wrong about this part of the Russian rail network! Connecting the European rail network (from Moscow) with the Chinese rail network (from Beijing), this massive rail network services a wide range of trains across Siberia, including several Russian domestic trains and a handful of direct international trains. The Trans-Siberian train route from Moscow to Vladivostok is also the longest rail journey in the world, covering 9286 km within 8 days, and running across 11 time zones! With its potential for epic train rides, taking the Trans-Siberian railway from one end to the other is a common item in every traveller's bucket list. Unsurprisingly, my bucket list also features travelling on this massive rail network, which I finally decided to fulfil! As much as I would love to laze in the train cabin and watch the landscape roll by till my arrival in Moscow, I had a budget to adhere to. As such, I had to choose cheaper train lines to travel on, and vary my transportation options. Contrary to popular belief, there is no official "Trans-Siberian Express", though there are trains that run from end-to-end of the network. Such straight rides do not come cheap: a one-way train ticket from Beijing to Moscow, including a bed in a 4-berth sleeper, costs at least S$1000! Fortunately, there are cheaper choices for train rides towards the west, such as the Trans-Mongolian (train travelling through Mongolia) and the Trans-Manchurian (the train between Moscow and Beijing), though those do not cover the entire rail network. After much consideration, I decided to forgo travelling the entire journey by train. I decided to take buses if it was cheaper or if the departure timings suited my schedule better. In total, I spent around S$500 on transport for my journey from Beijing to Moscow. After the smooth border crossing, I took the overnight sleeper train from the Mongolian border town of Zamyn-Uud to the capital, Ulaanbaatar. The sleeper operates daily, leaving at 18:30 and arriving in Ulaanbaatar at 09:00 the next morning. The most common route from Ulaanbaatar is to take the Trans-Mongolian to Ulan Ude in Russia. With its proximity to the beautiful Lake Baikal, Ulan Ude is the ideal place to take a detour and explore the region. However, I did not plan to enter Russia this early in my journey, and chose to head towards the western Mongolian city of Khovd instead. I wanted to explore more of this country, and experience life as a nomad. As Mongolia has no railway network connecting its eastern and western region, I took a bus to Khovd from Ulaanbaatar. After spending two weeks in this amazing country of rustic villages and sweeping plains, I decided to move on. It was finally time to enter Central Asia!